Now for the second half of our Saturday night Work-a-Thon and beyond! 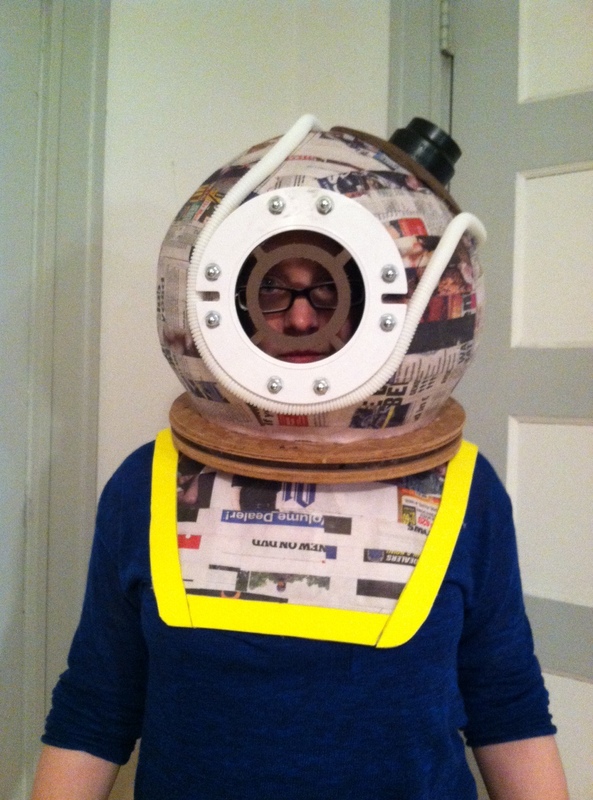 While Daniel was working away on Eleanor Lamb‘s helmet, I was busy with the harness. Even though it’s not the flashy, hardware speckled spectacle that Subject Delta’s harness was, Eleanor’s harness posed its own set of difficult intricacies. All that I needed to do was attach a foam liner along the outer edge which might seem like a simple task until you take into account the imperfections in the proportions of the frame. Sure, building these on ourselves made for a snug, customized look, but like most bodies our are asymmetrical. In other words, we’re crooked and crooked is difficult to line in ruler straight strips of foam. The front was no problem but the back, oh boy, the back is where I ran into some hangups. This is a decent angle for you to really see the hump on the back of the harness which, at a glance, doesn’t seem like it should be too much trouble. Until I laid a strip of foam along the edge, I didn’t think it would be too bad either. 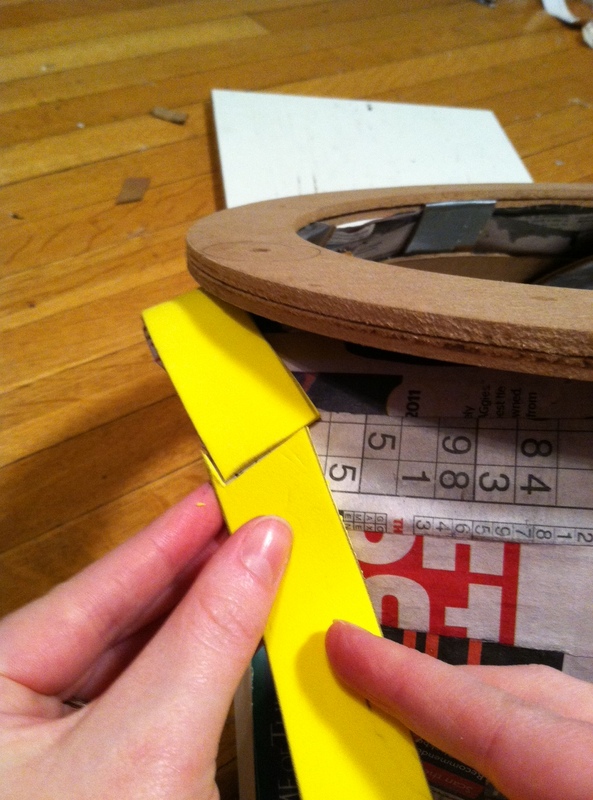 Until I discovered that I would have to “Frankenstein” the strips of foam together with little cuts and hot glue. It took about four different pieces of foam in an 8 inch section and then three strips on the other side. It was a hassle but it was satisfying! 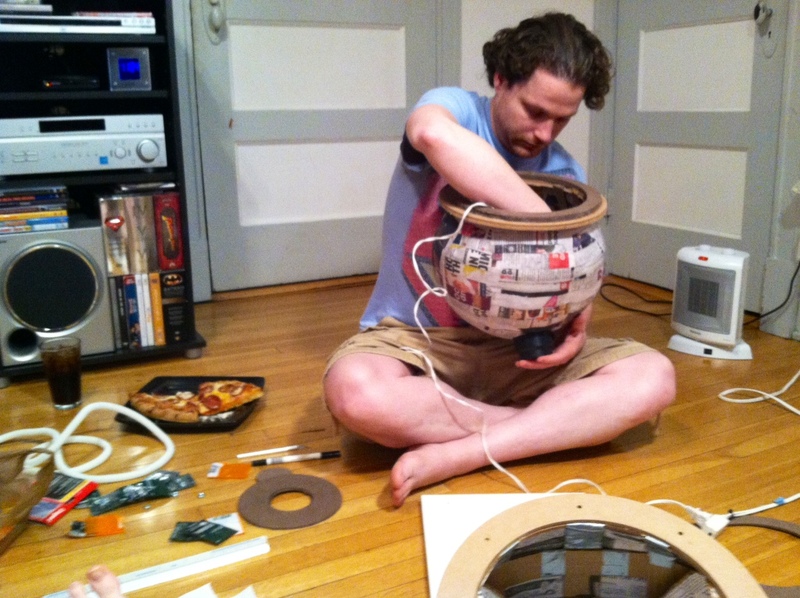 While this may be hard to believe, in all the months that we’ve been working on this project, this was the first where we both needed the glue gun at the same time. 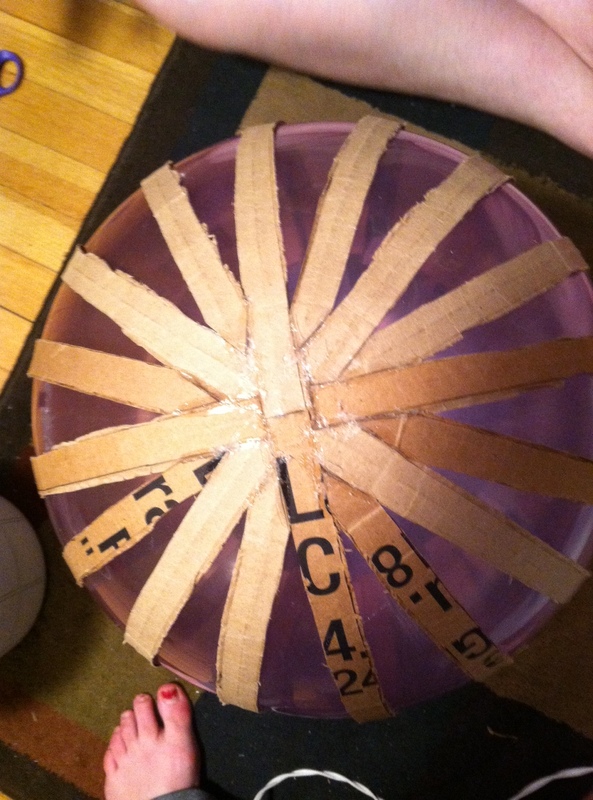 And instead of going out to buy a second glue gun, like normal people, we decided to share it. And by share it, I mean sliding it back and forth to one between opposite ends of the wooden board we were using as a single work surface. I’m sure it was both amusing and adorable. We’ve been told we’re adorable. Notice anything askew? 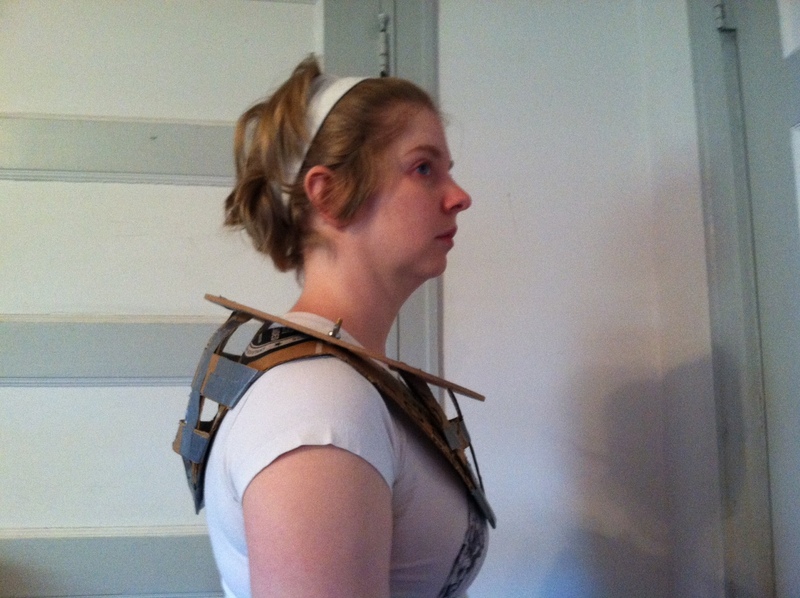 Aside from my looking like I have a brown mustache, that harness is incredibly crooked. At first, we wondered if this was because of the way I was standing but, sadly, the bright yellow lining made clear our mistake but we had to wait until the next day to fix it. Bright and early the next morning, before I even brushed my teeth, I was up and working. Daniel went to go get breakfast but, before he left, I had him take a couple of reference pictures. Turns out the source of the problem was a big freaking gap between my left shoulder and the harness. 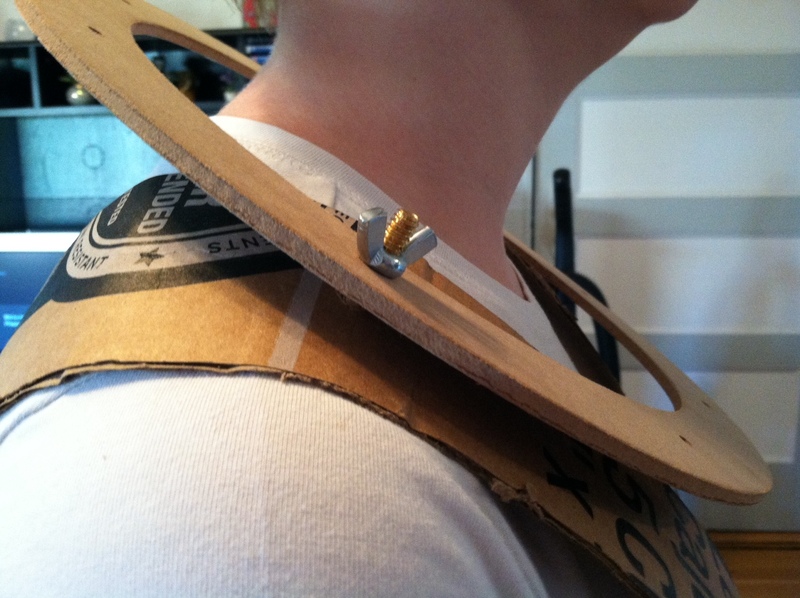 Looks like I might have had some major tension in that shoulder while Daniel was building the frame. So I whipped out the old glue gun, cut some strips of 5 mm craft foam and made some foam pads. The difference was amazing! And with that little hitch out of our way, we were just a short sprint away from completing the harness. 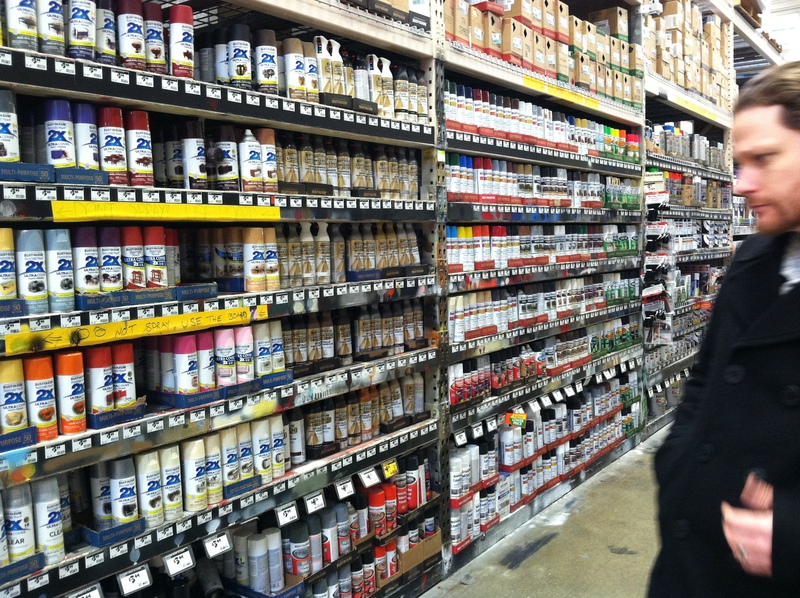 But while I stretch in preparation for the 10 yard dash, Daniel’s going to tell you about his new favorite product. Rubber Weatherseal!!! It’s made for doors and windows but, man, is it my new favorite material to work with. 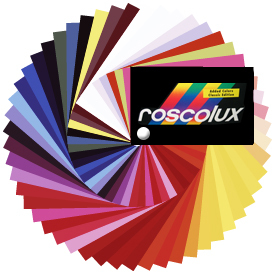 It comes in a variety of shapes, has its own built-in adhesive strip and is made of durable, flexible rubber. How can you not love it already? I came across this little gem while perusing the aisles of Home Depot in search of something to use for the seam work on Eleanor Lamb’s helmet. We sketched out the shape of the seams using one of our black markers, cut the pieces to fit, peeled off the self-adhesive backing and laid them in place. Easiest step we’ve had to date! And we’re always thankful for an affordable product that saves us time! 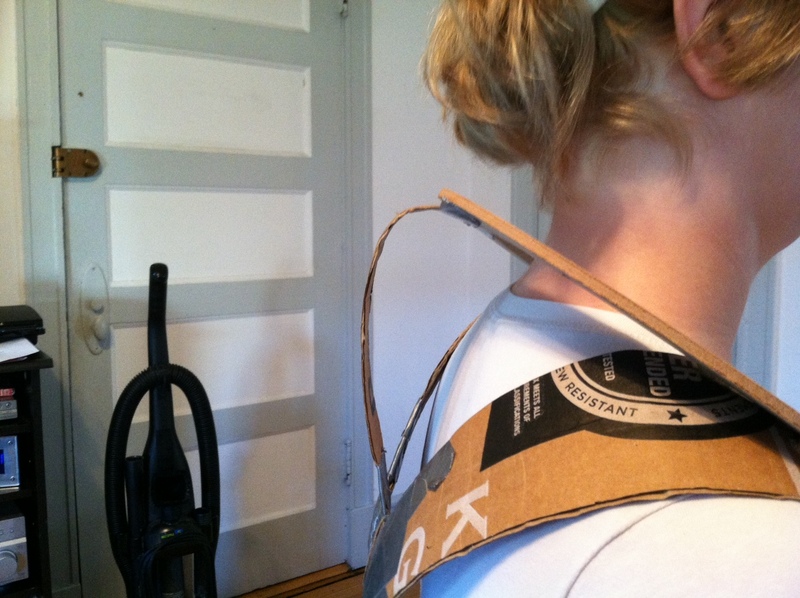 You can also see that we added the little port holes to the back. Just like Subject Delta’s helmet we used plastic insulating bushing rings, found from the plumbing section at Home Depot. They come in all sizes which lend a bit of consistency as we moved from size to size between the two of our helmets. Next, we applied a second layer of the 2 mm craft foam to the edges of the harness, a bit of that magic weatherseal, a couple of those wire rope clips, seven wing nuts and the harness was all set! 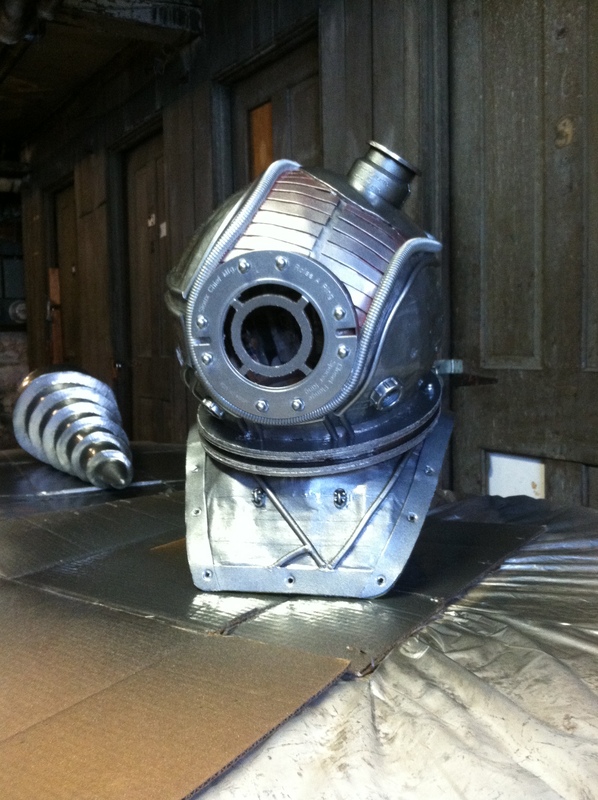 This was a very quick step since most of these materials and processes were used on Subject Delta’s helmet. 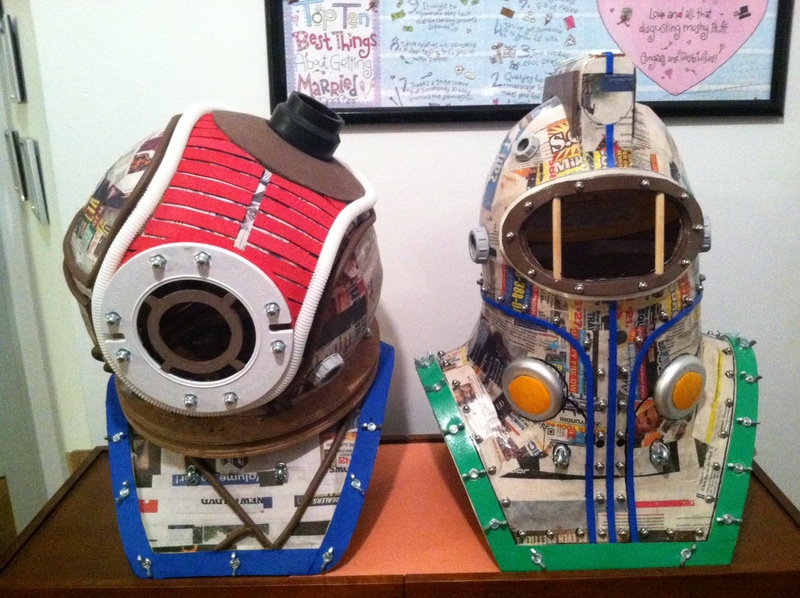 The next to last step concerns the little panels you see running along the top of Eleanor Lamb’s helmet between the main porthole and the “little hat,” as we’ve taken to calling it. 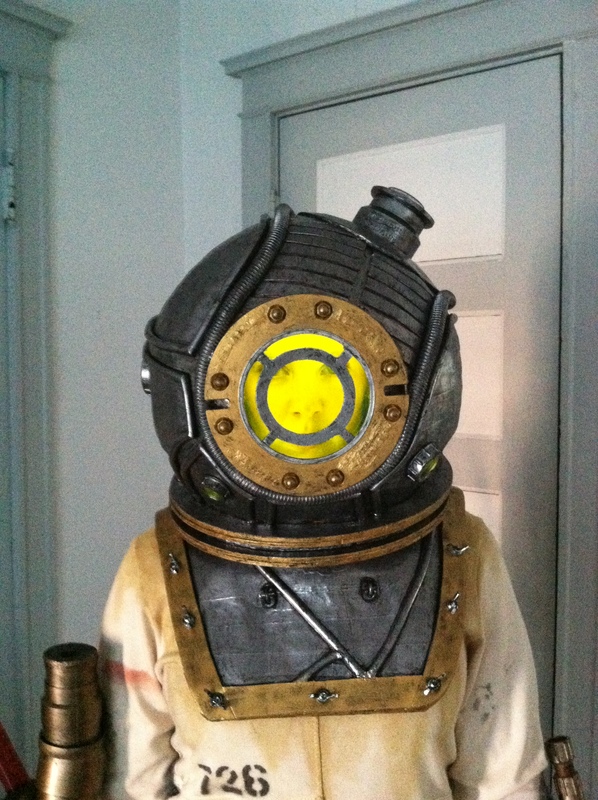 We decided to make these out of 2 mm craft foam strips that would be glued to the helmet and tucked beneath the flex tubing that runs between the porthole and the little hat. Daniel cut, positioned and then trimmed with the X-acto knife each individual strip. He then glued them into place being careful of the spacing not only between each strip but between the two rows as well. With most of the details now in place, I cut a couple of rings out of 5 mm craft foam, Daniel slapped some wood glue between the layers and voila – we’ve got ourselves a bonafide Eleanor Lamb helmet! We attempted several selfies so that you guys could get an epically awesome picture of the two for us in our helmets but none of them met our high standard of Bioshocking awesomeness. So we’ll get that together for you all to enjoy in the next post. Absence makes the heart grow fonder, and boy, have we missed all of you! We’ve been cooking up something big and it just didn’t seem right to give you little teasers when our end goal was just within finger’s reach. 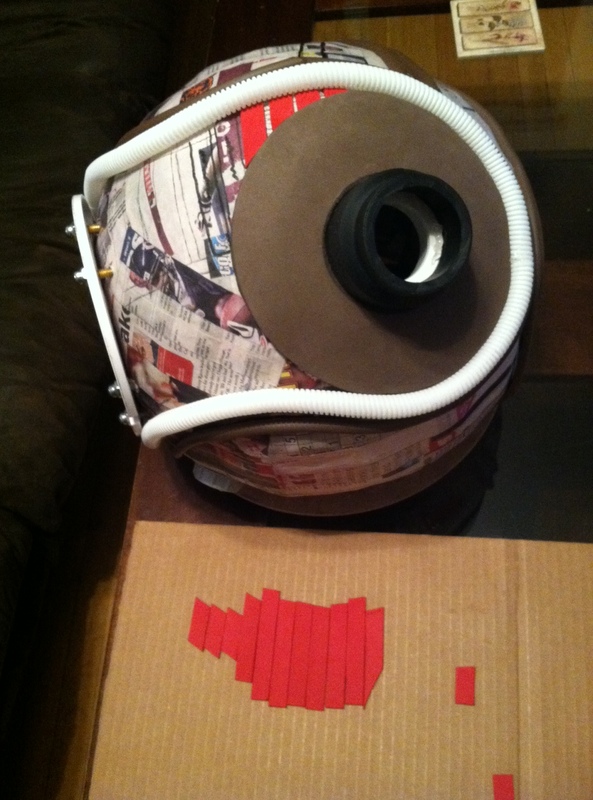 We’ve been collecting more materials from Home Depot and cutting more tiny little foam pieces. We’ve been working separately and together; trying to accommodate each other’s evenings all the while making progress. We’re really proud to give you this picture. But fear not! We’re not going to stop at simply showing you a picture. No! We’ll fill you in on exactly how we got here. Wouldn’t want you to miss out on all the fun! 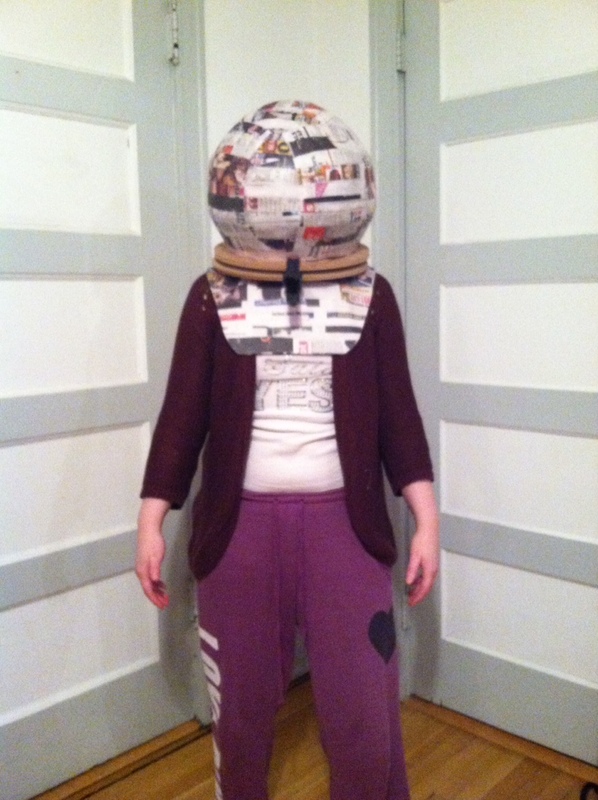 If you’ll think back two weeks ago, we’d left Eleanor Lamb‘s helmet at the papier-mâché phase. 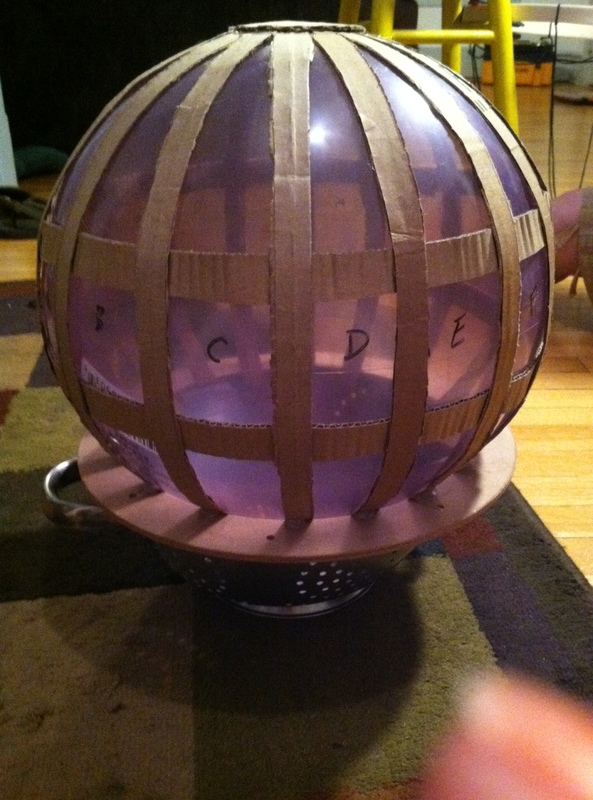 The helmet and the harness were each connected to their own wooden circle base but before we could join them, we needed to divide and conquer. With a horror movie remake marathon on TV, Daniel and I settled in for a work filled Saturday night. 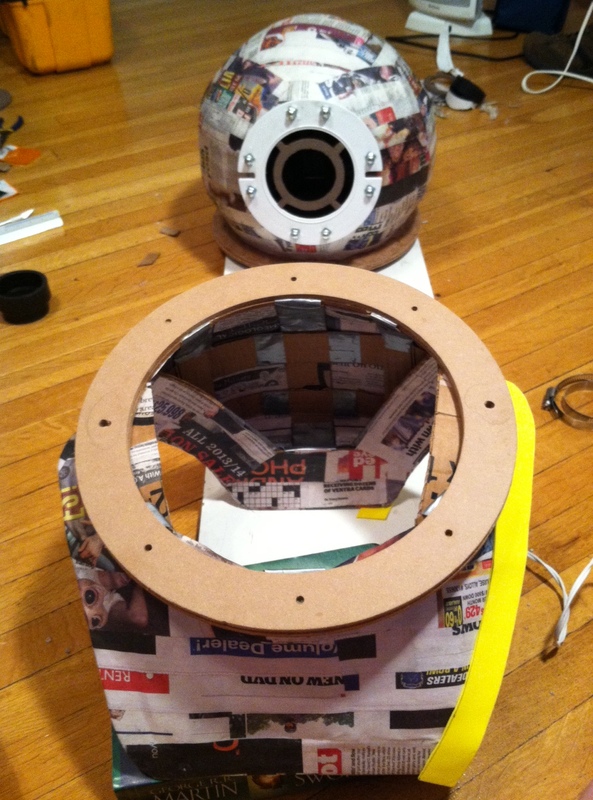 First things first; the porthole. 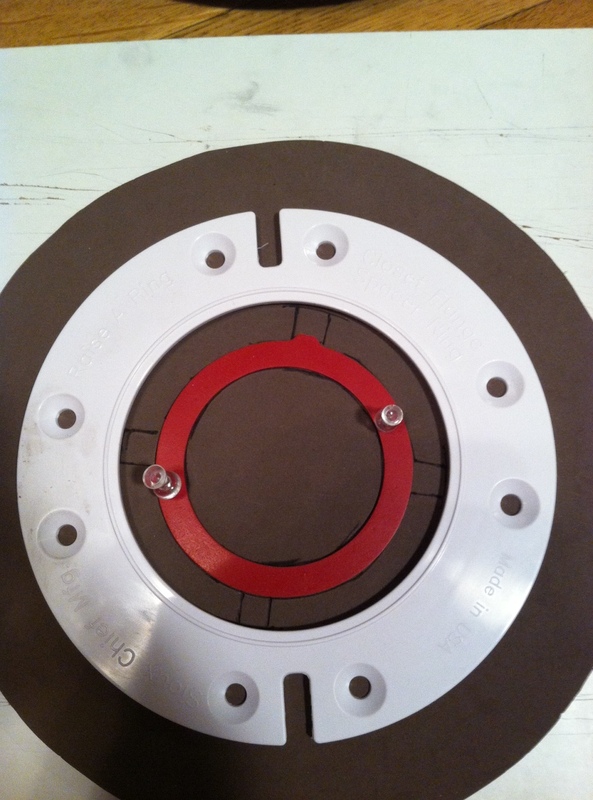 We bought a closet flange spacer ring for the actual porthole and a sealing ring to use for the inner ring but, when we set everything out, we found that it would be easier to use the ring as a stencil and cut the whole thing out of craft foam. 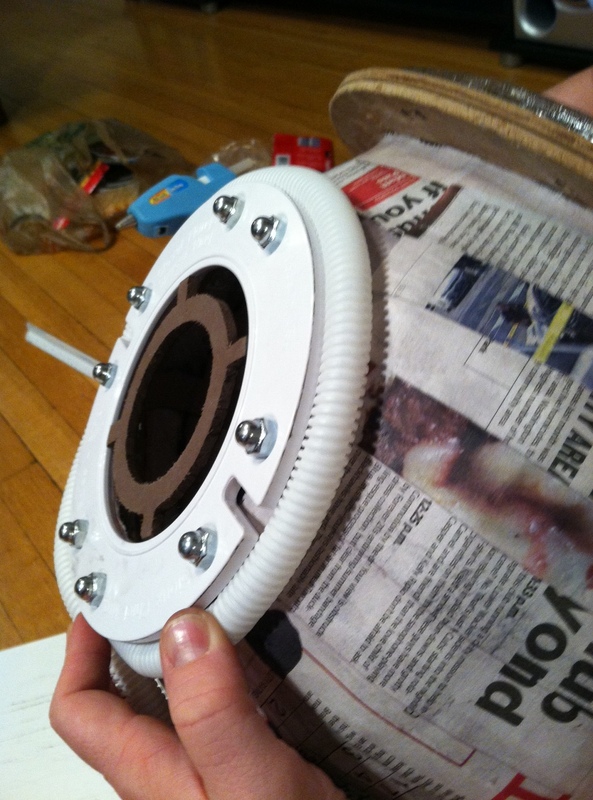 Then it was just a matter of hot gluing the foam into the spacer ring and we had our completed port-hole. 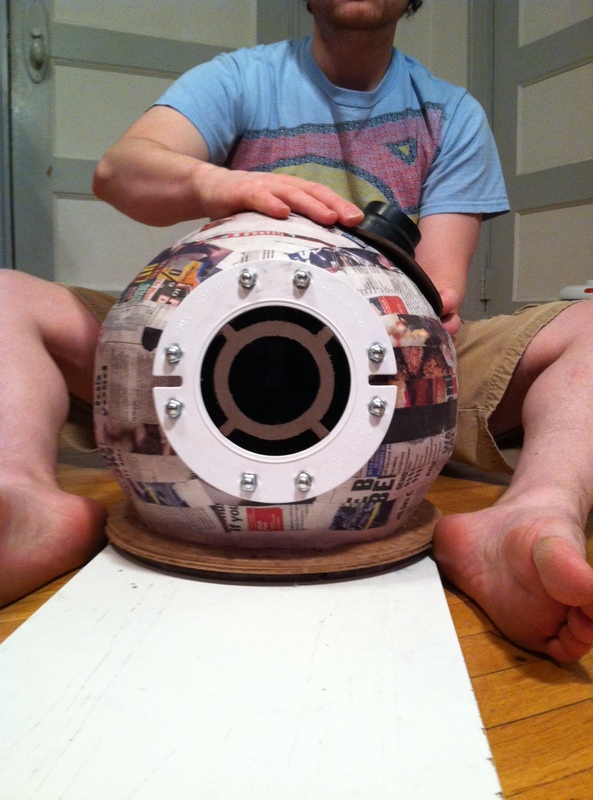 As Daniel traced the shape of the porthole onto the papier-mâché sphere I asked him if he was having flashbacks to the last helmet he punctured and he said that it’s easier the second time. And sure enough it was. He didn’t even ask me to mute the TV as he worked. What a steady hand one helmet’s worth of confidence can give you! 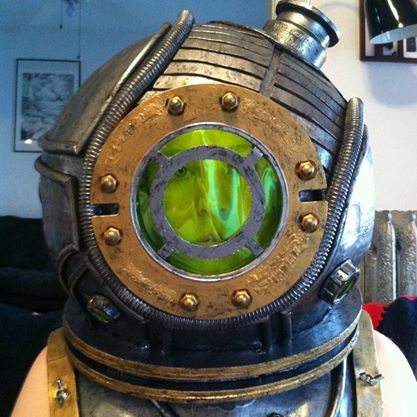 Now to screw the porthole into the actual helmet. Our first attempt was off. 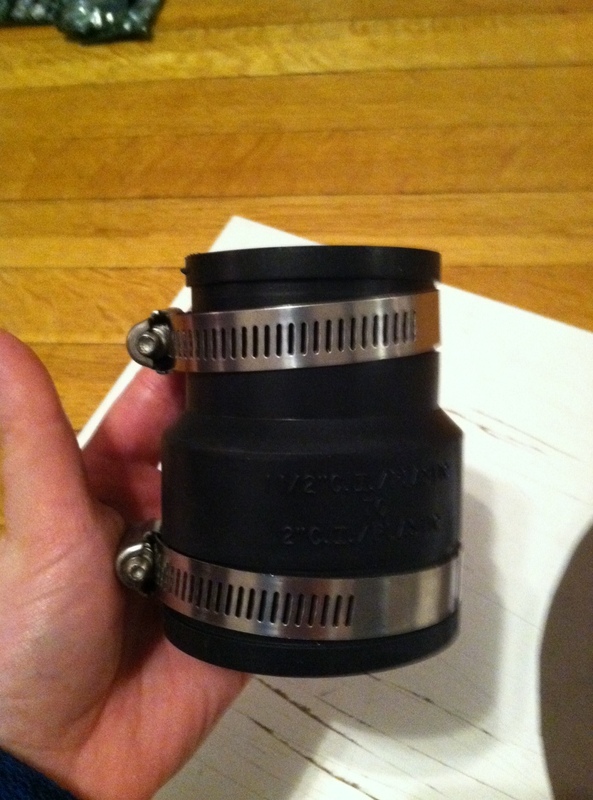 Seems we need different lengths of screws to get a flat item onto the surface of a round item; duh! 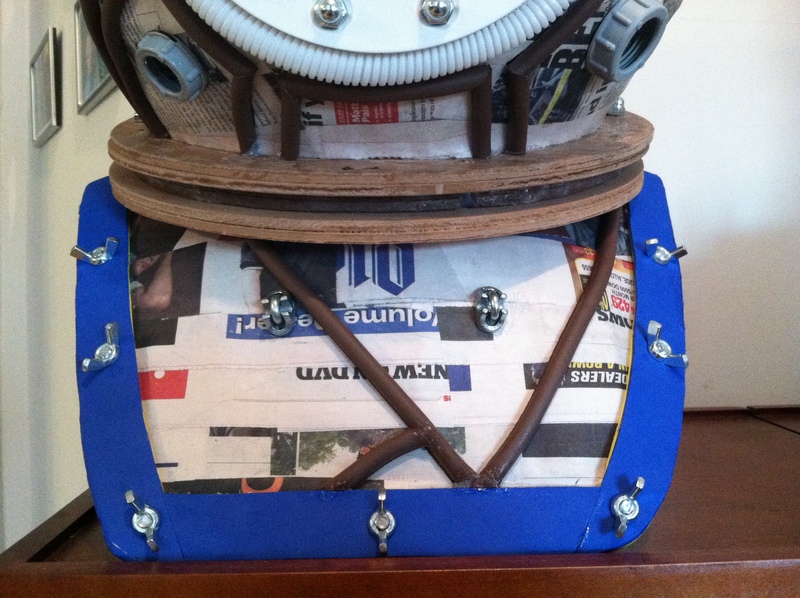 Luckily we had a few longer screws left over from the handles that wound up on the back of Subject Delta’s helmet. 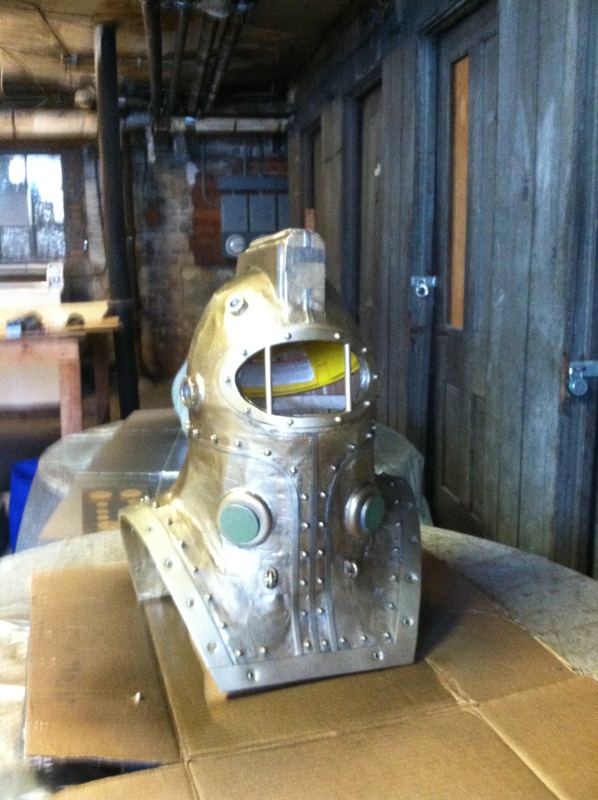 Just a few screws and we had ourselves a lovely looking porthole for Eleanor Lamb’s helmet. You’ll notice the little black knob up Daniel’s left arm, his left, your right. 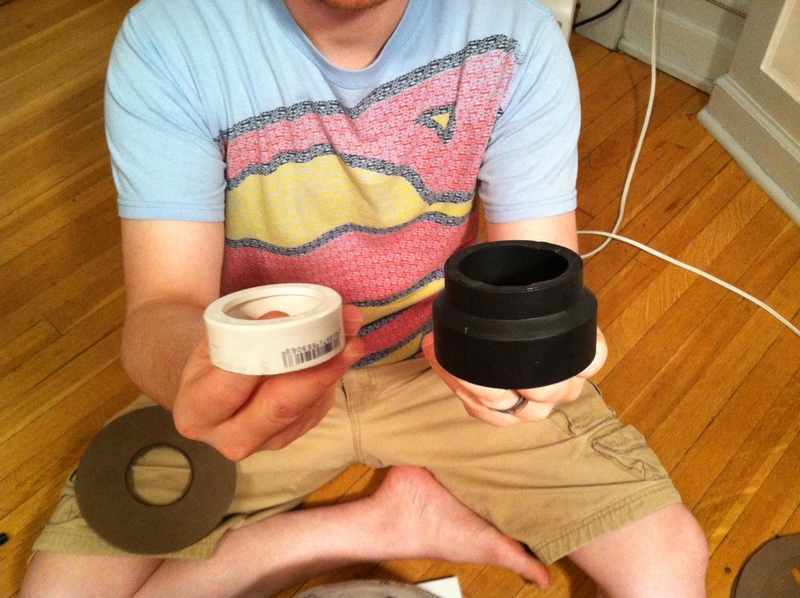 That is a bit of flexible PVC pipe coupling we found at Home Depot. If you’ll check out the reference photo again you’ll notice what looks like a knob on the top of her helmet and the coupling was already close to the shape we needed. We trimmed some off the top and bottom, paired it with another PVC ring and we were just about ready to put it on the helmet. 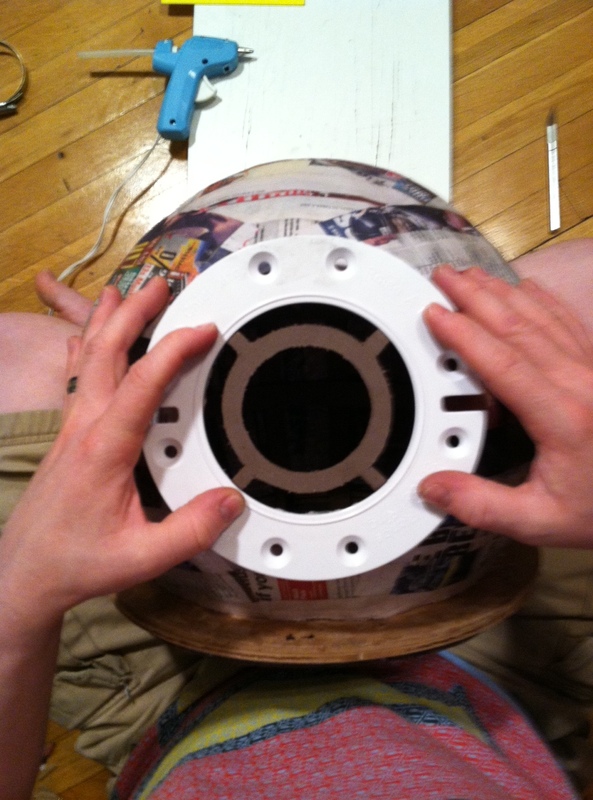 Daniel drilled yet another hole into the helmet, just big enough for the bottom piece of PVC. Then we sealed the top and bottom with hot glue. 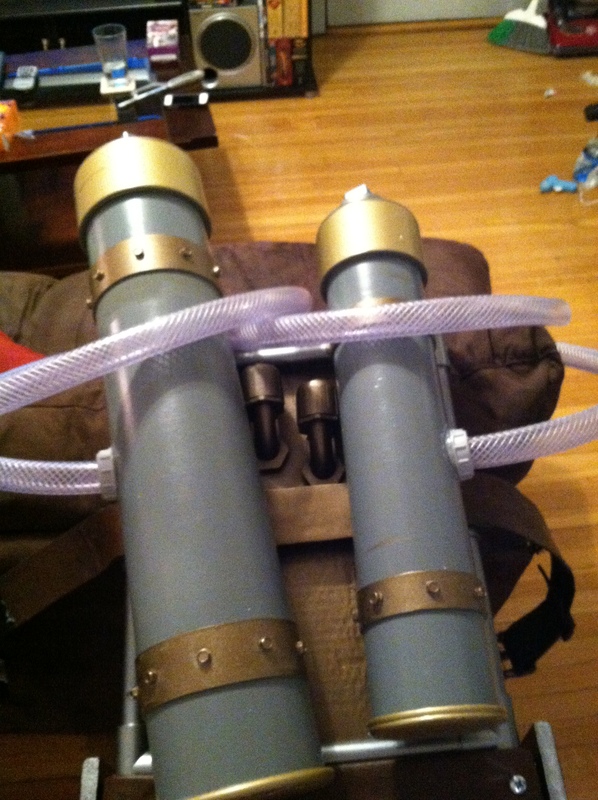 Next, we added a bottom layer of foam and we were ready for the fun part; the ribbed tubing that runs around the front and top port-holes. We used some flex tubing and, after a fun little game of tug-o-war, it was ready to stretch out and loop over the helmet. Daniel secured it with heaps of hot glue and this is what we ended up with; a handy-dandy way to cover up those pesky screws. Oh. 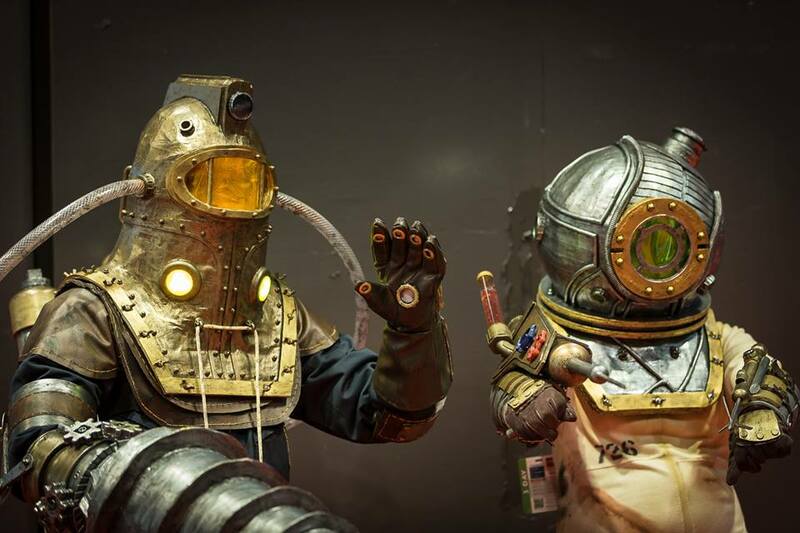 Did I mention that C2E2 tickets go on sale this week? Color me excited! Daniel has spent the last two weeks with his back hunched over Eleanor Lamb‘s helmet and harness, his fingers pruned and coated in glue and little bits of news paper. 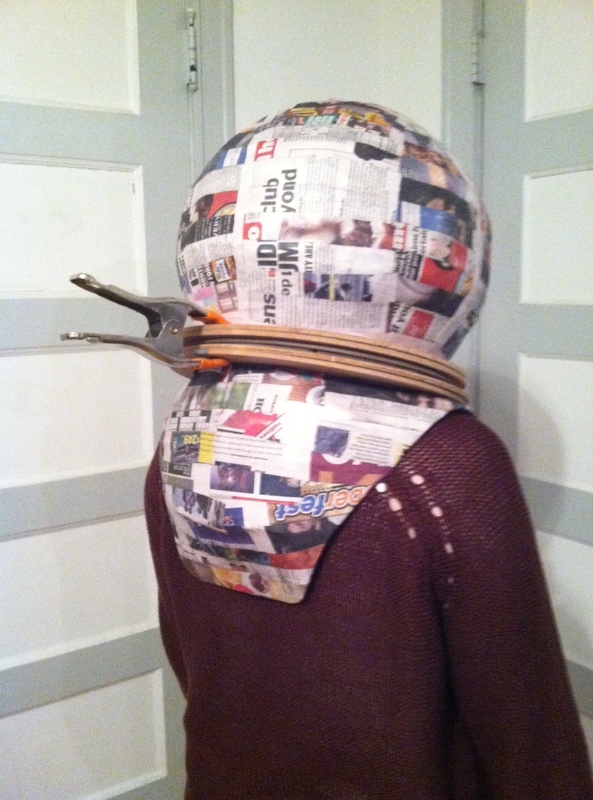 He’s been papier-mâché-ing like a mad man! 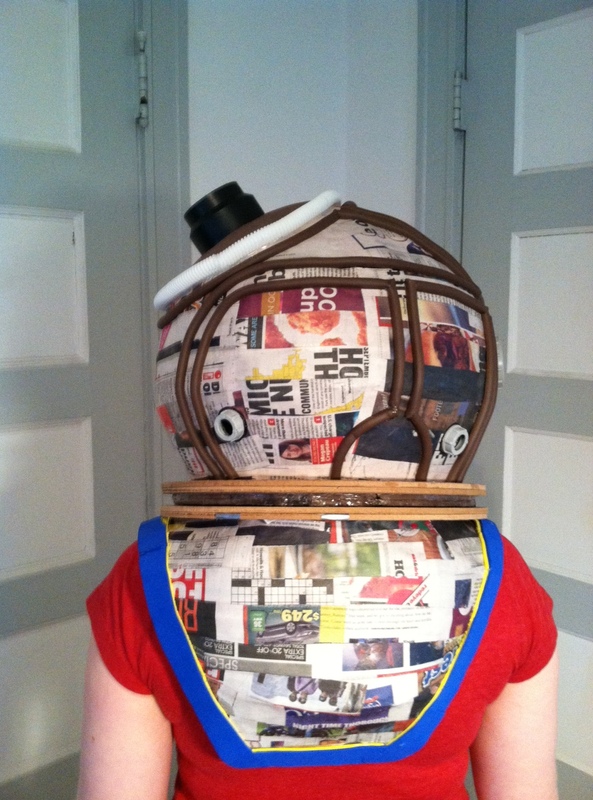 He finished up layers three, four, five and six on the helmet and he finally achieved a globular, less egg-like shape. He has determined through trial and error that paper from The Onion is less sturdy than paper from our local Red Eye, in case you’re thinking of starting a papier-mâché habit in the area. The harness didn’t take nearly as many layers due to Daniel’s superior craftsmanship. 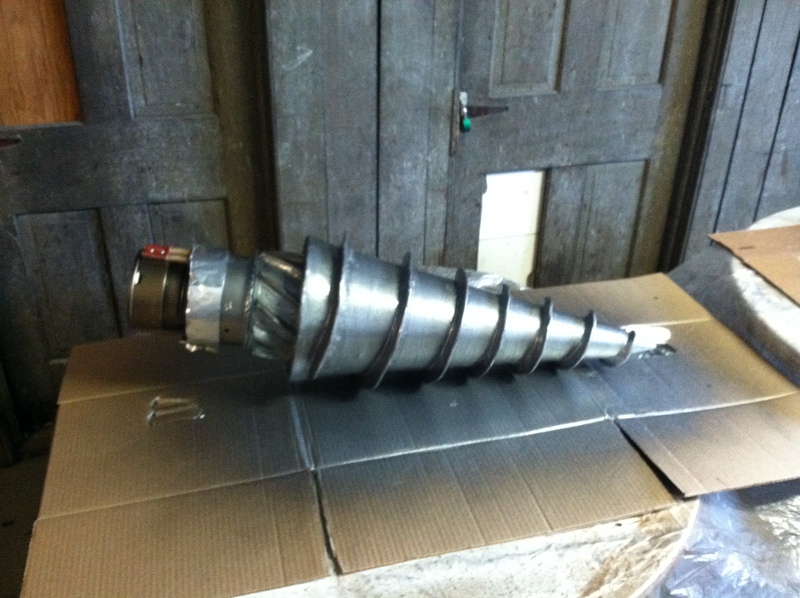 The shape might also have been a contributing factor. After a few layers, we ended up with this. Not too shabby if I do say so myself. However, if we check out the reference picture you’ll see that we need a more rounded edge. 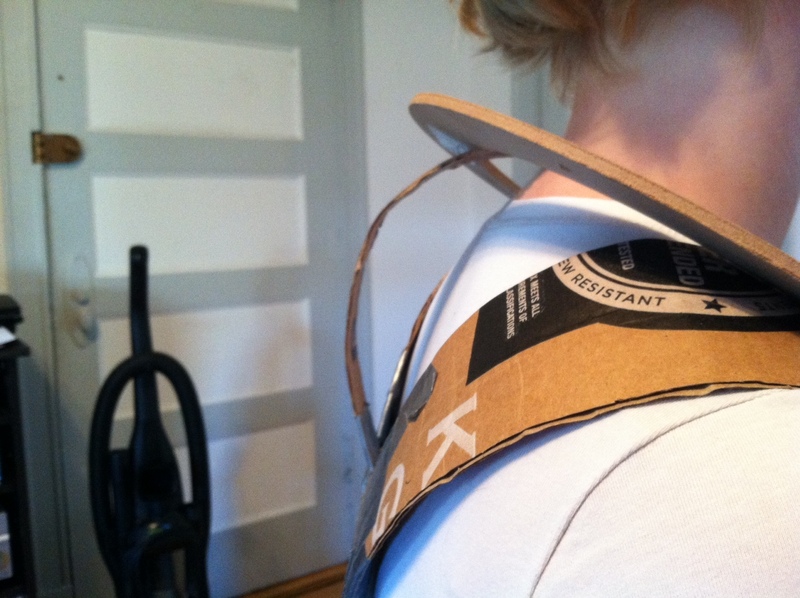 So I cut some rounded strips of card board, along with a couple of very thin strips that tapered into the top of the harness near the shoulder. While this may not sound like a large variation, here’s a side by side comparison of the before and after. 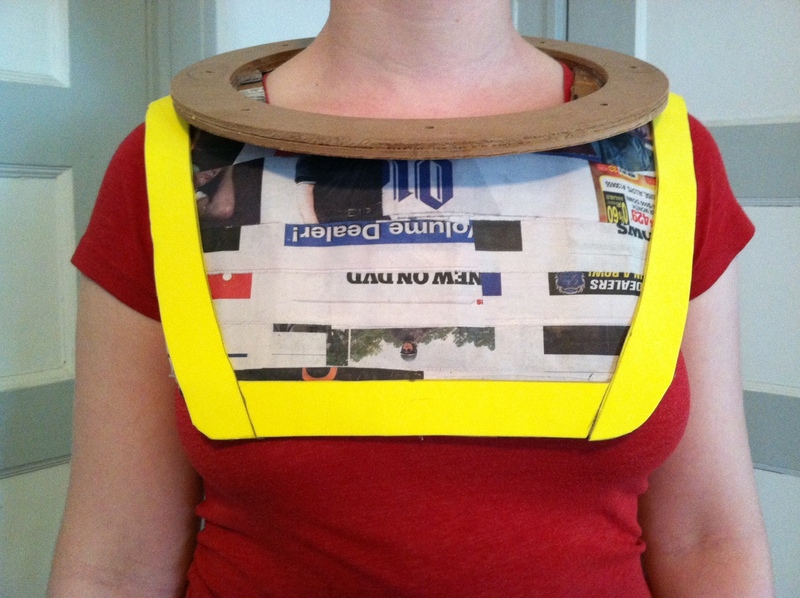 On the left you’ll see the whole structure looking blockish on the front and square on the shoulders. 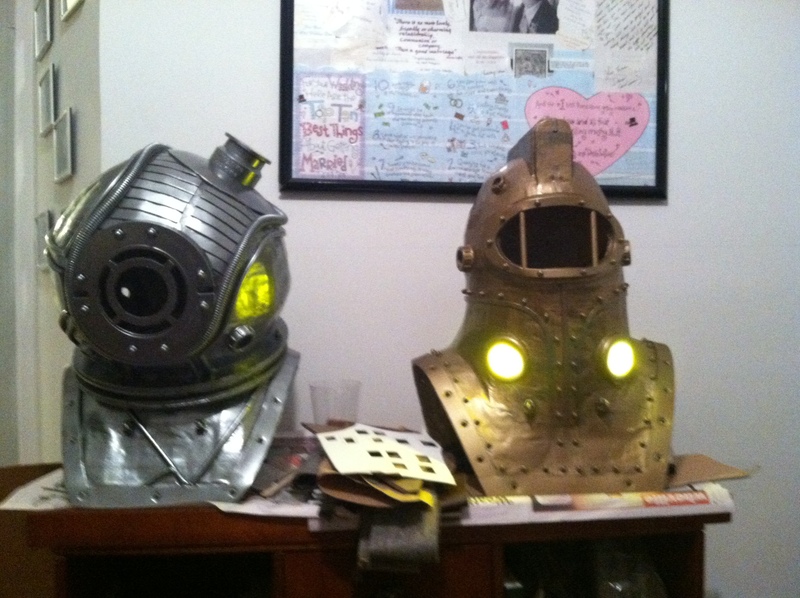 On the right, you’ll see what it looks like with the additions to the front and the shoulders. 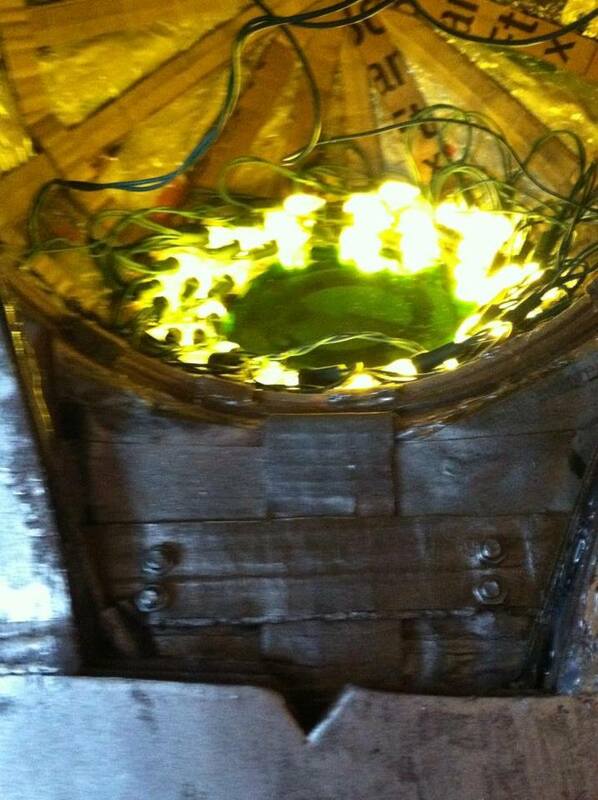 We added some foam rings between the wooden rings to give it some extra height. I’d say it’s coming together nicely, wouldn’t you? 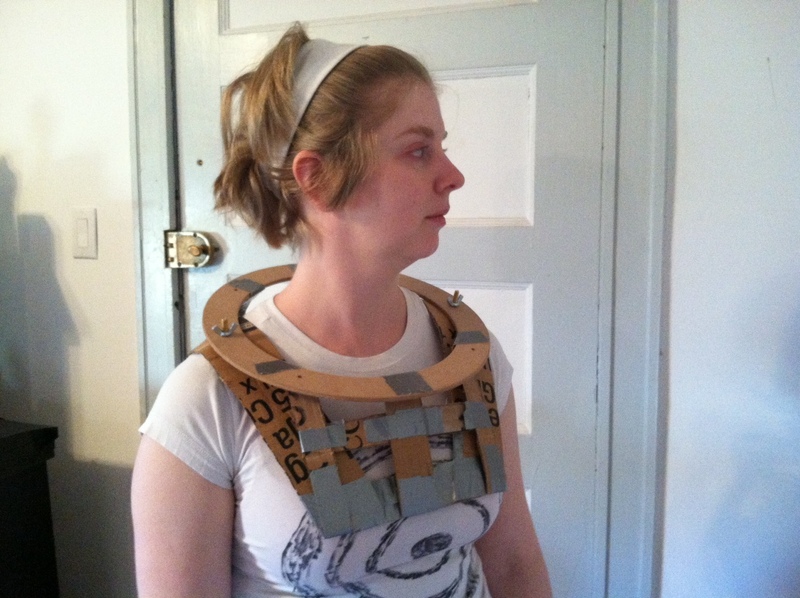 Remember when I asked all of you to knock on some wood because Daniel kept saying that Eleanor Lamb‘s helmet and harness would be easy to build? Thank you to all of you that did because it must have been enough to keep Murphy from moving in or even squatting in the yard. We have some amazing pictures to show you but not a lot to describe because we’ve been there and done that and you’ve all been there and done that with us! 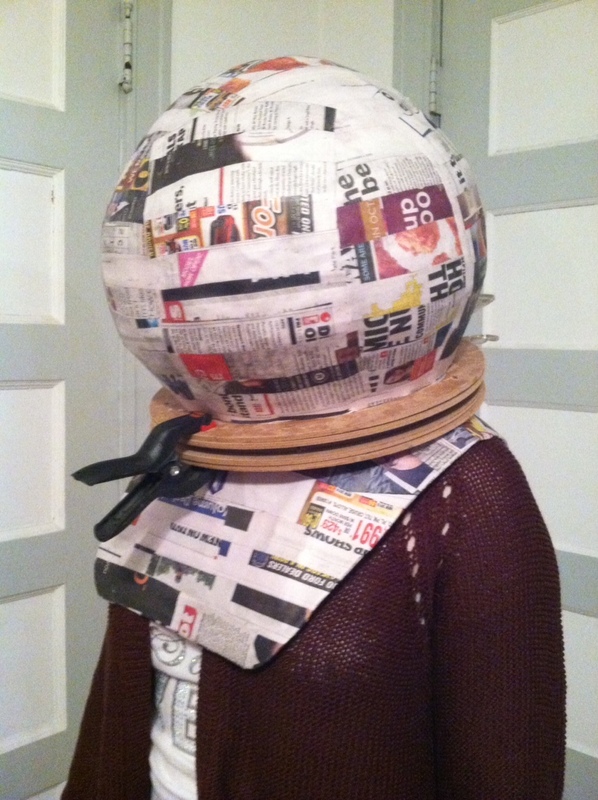 The last time you saw Eleanor Lamb’s helmet, I was reinforcing the frame in preparation for papier-mâché. Daniel had expressed some concern about applying papier-mâché to the plastic ball. 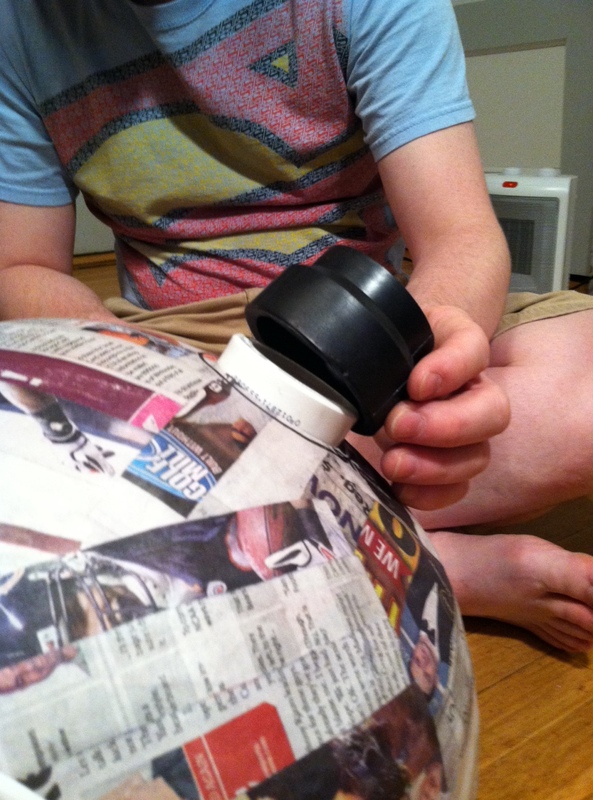 He was worried that when we popped the ball would take the papier-mâché with it. 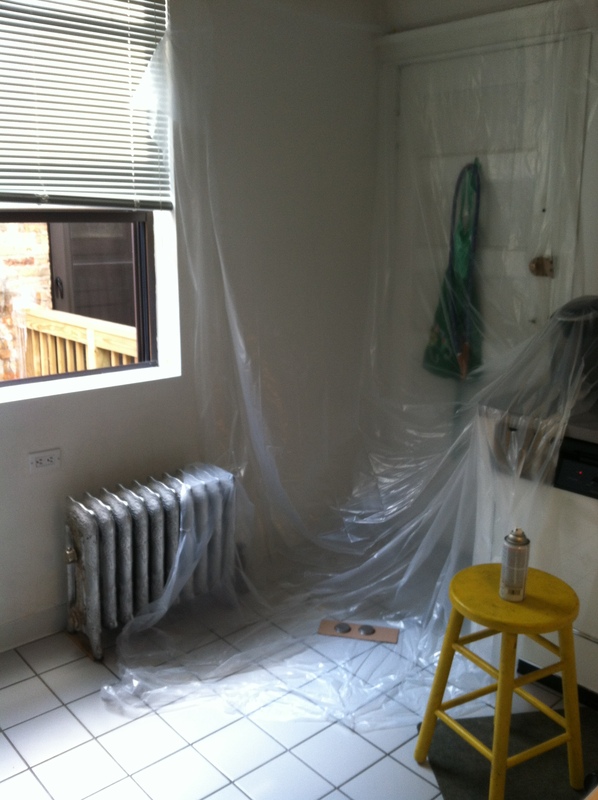 His solution was to case it in Saran Wrap before beginning the tedious task of papier-mâché. 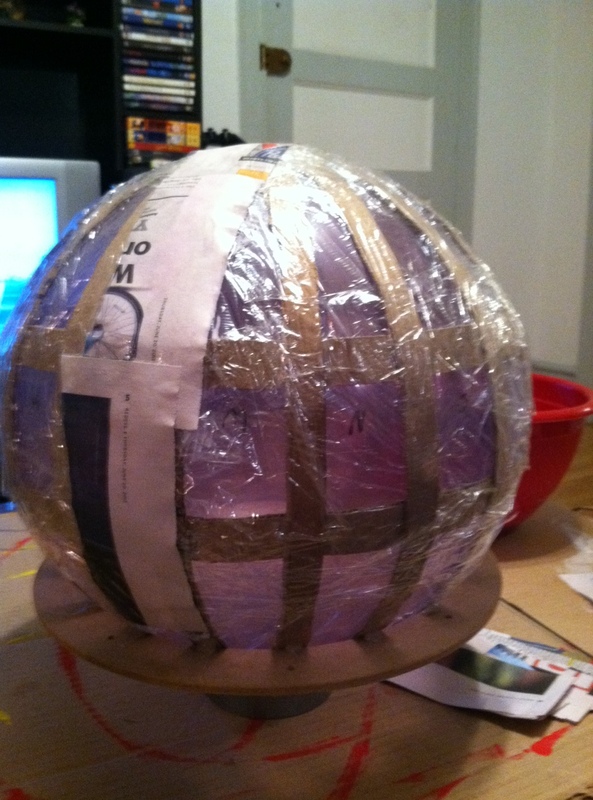 Daniel applied two layers of papier-mâché and before we knew it, the time had come to pop the plastic ball. Of course we did wait until the papier-mâché had a chance to dry and set but I’ll never forget the way Daniel came around the couch with the helmet in his hands like a cake with candles and announced it was time to pop the ball! 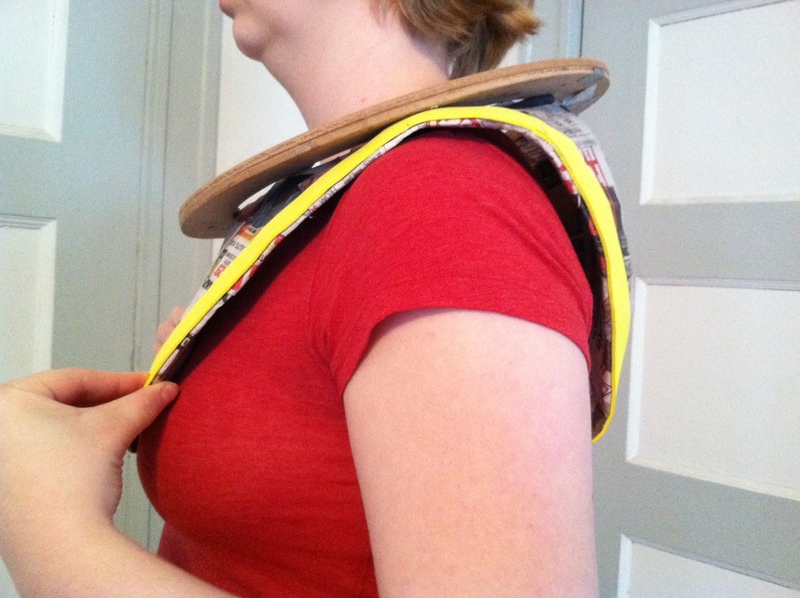 Next, it was time to make the harness. 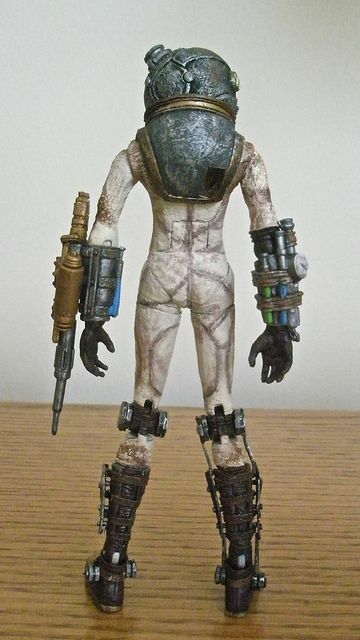 I’m sure you all remember the nightmare that was building Subject Delta’s helmet. And while I anguished over the building and the taping and the cardboard strip cutting, I couldn’t sympathize with Daniel having to sit and stand still for upwards of four hours until it was my turn to be the model. Daniel worked for maybe two and a half hours on me but I was achy and grumpy and my legs kept sticking to the wooden stool we were using for me to perch on. In short, I was a wiggly model. I’m sure it was like trying to cut the hair of a toddler. 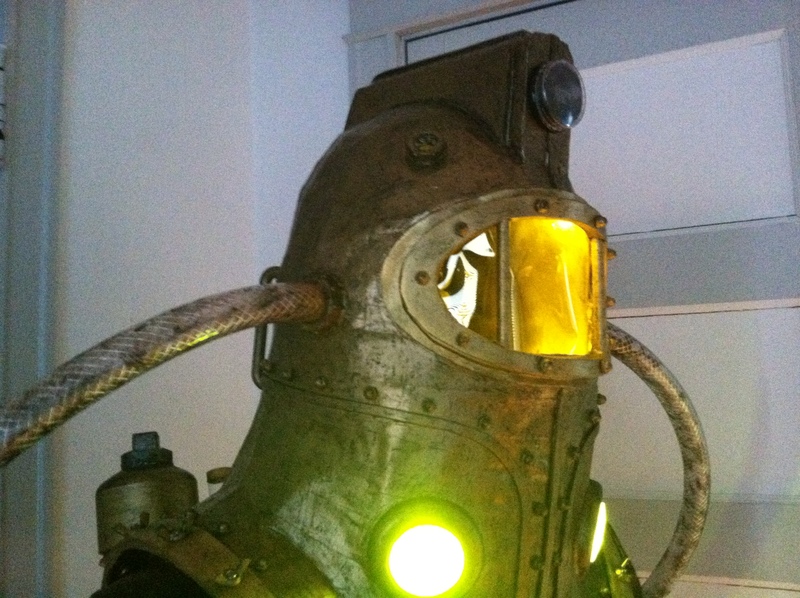 But, to quote Daniel, we learned a lot from Subject Delta’s helmet, and it benefited this stage immensely. 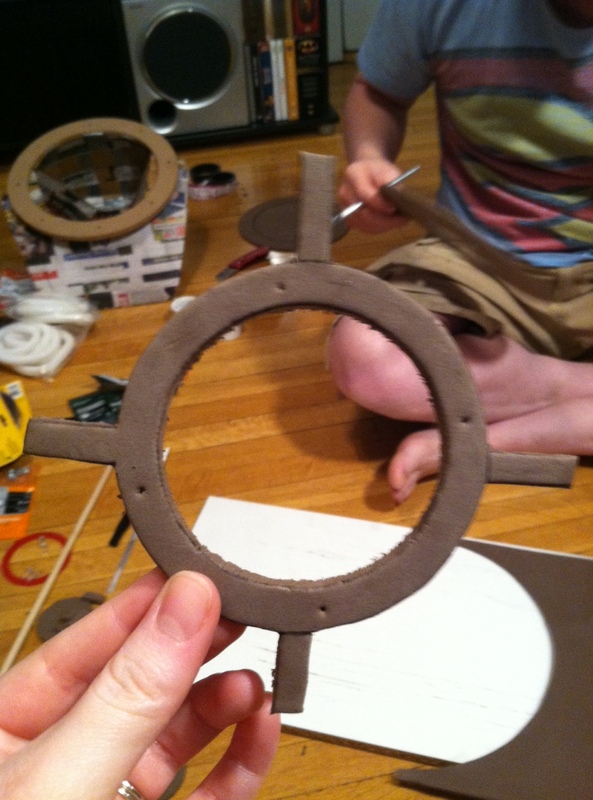 Daniel taped the outline of the harness directly to me and then screwed one of our wooden circles into place. This allowed us to really get the angle in place before trying to construct the rest of it. 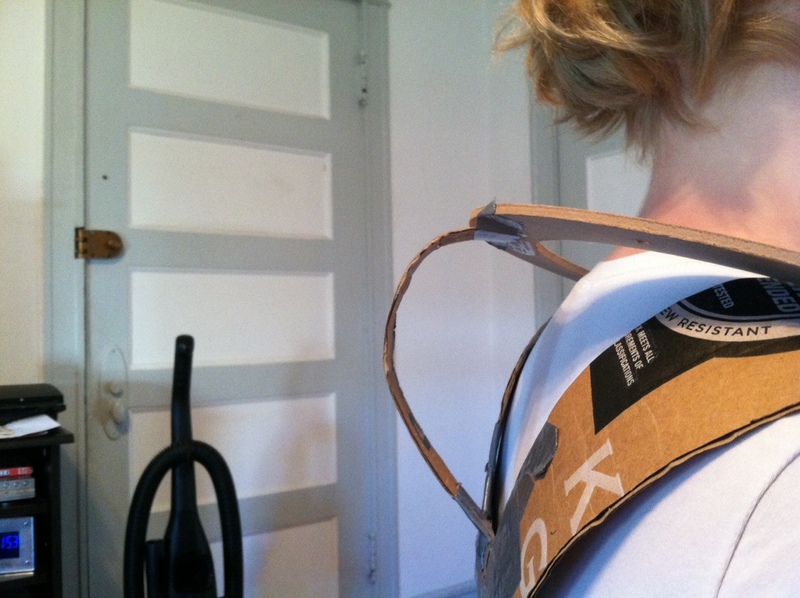 The only difficult section was the hump on the back of the harness. In case you can’t tell from my photos, I’m really small so there isn’t a whole lot of length to my back and shoulders for him to work with. 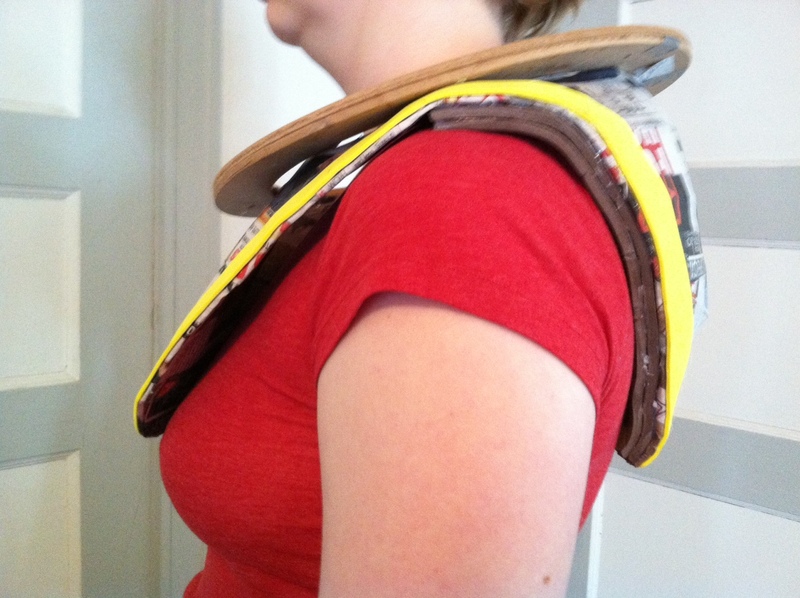 But within a couple of hours of measuring, cutting and duct taping we had a completely constructed harness that looked a little something like this! This week, we’re doing things a little differently in order to accommodate our crazy schedules. We’ll be posting separately so you won’t have to go without a complete weekly dose of Those Crazy Gilberts! 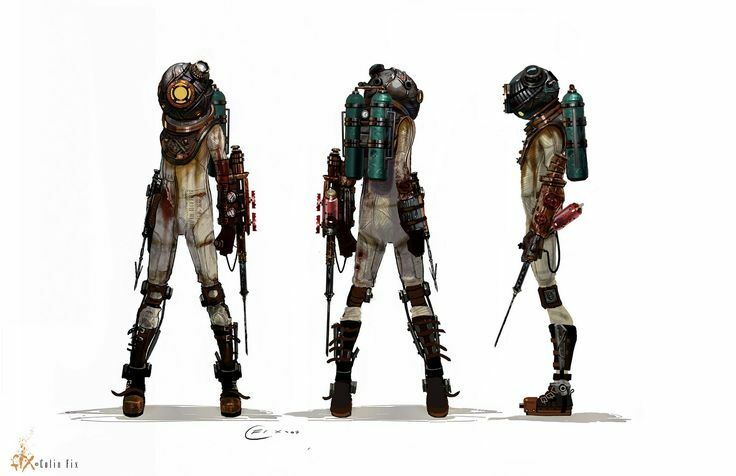 Last week, we were staring at the incomplete shell of Eleanor Lamb‘s helmet, wondering what the best course of action would be. The prospect of spending hours of work on the process of tracing and cutting and gluing wedges of cardboard into the frame was hardly appealing; there had to be another way. Finally, Daniel suggested that we lace more strips of cardboard through the vertical frame horizontally. This would give the helmet more stability once we popped the ball. 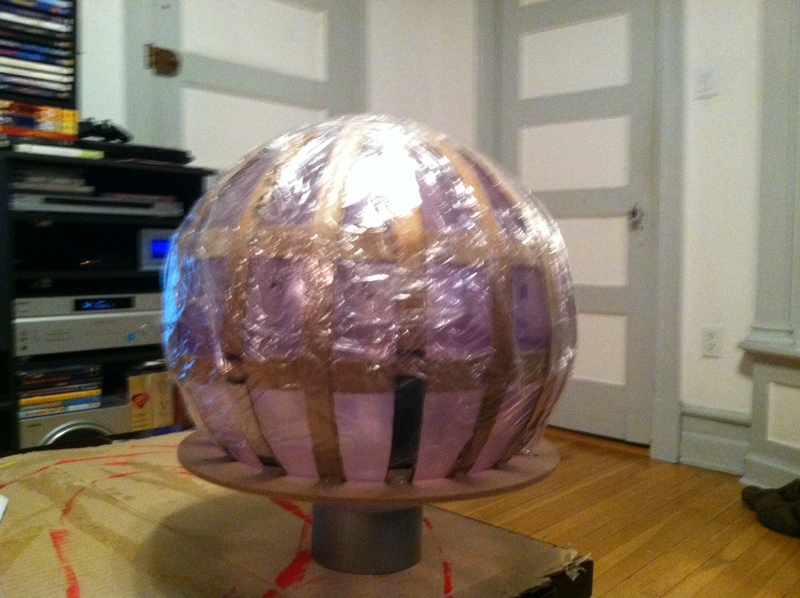 Then, he said, we could line it in cling wrap to keep the papier-mâché from adhering to the ball. Then we should be able to pop the ball and pull it out of the frame. 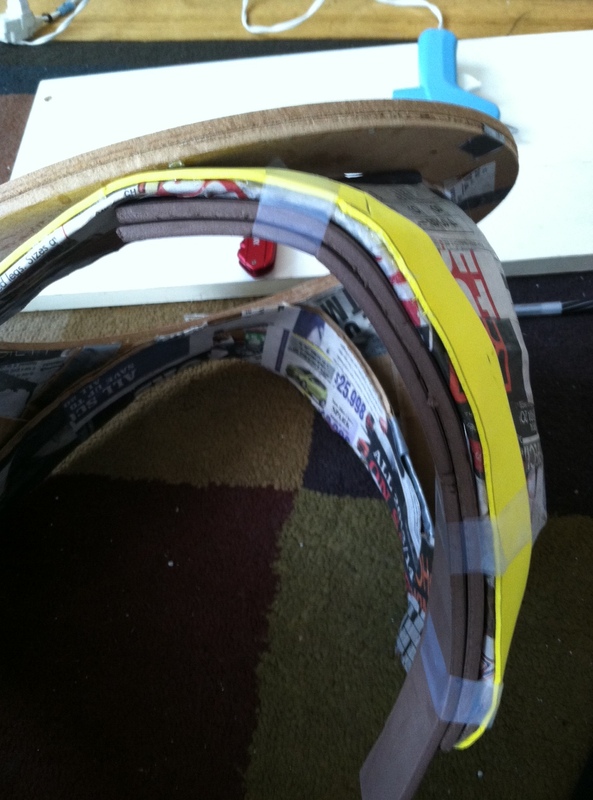 And so, I got to cutting even more cardboard strips. I can say with certainty that I’ve mentioned how much I hate cutting cardboard strips at this point. But it needed to be done, and thankfully we only needed three 41″ strips. I put out our most complete cardboard box and went to measure and cut. 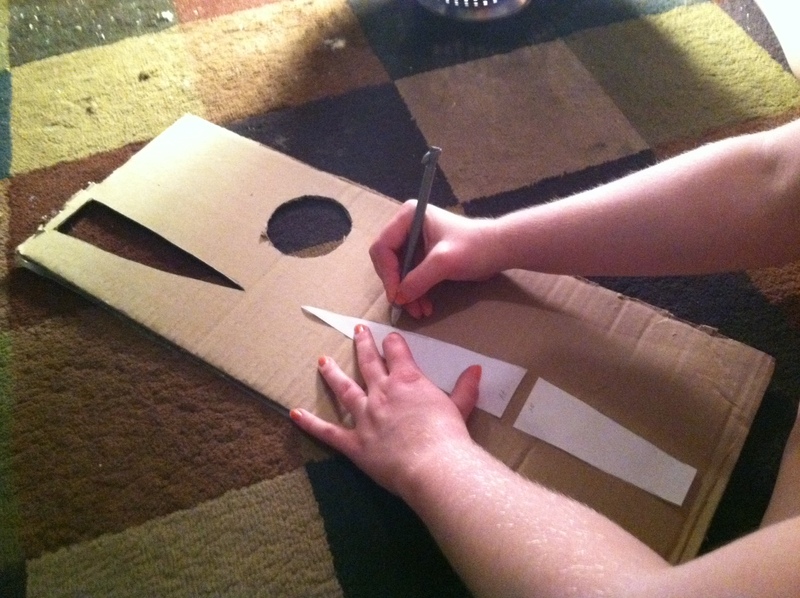 But I then realized that, when we cut the cardboard box, we hadn’t cut along the inner seam. Since we needed such long strips, we would need a piece of cardboard without seams so Daniel had to go all the way down from our third floor apartment to get me a brand new cardboard box. This might seem like something that should be obvious but, if I can save someone else a few steps; so be it! The lesson here is: when cutting open your cardboard boxes, always cut along the seam where the cardboard has been glued together. That way you have four full panels of continuous, glorious cardboard. Next, I got to weaving. I took the strips of cardboard and slipped them between the frame and the ball and then glued the seam together with hot glue as we’d done to the top star steam. 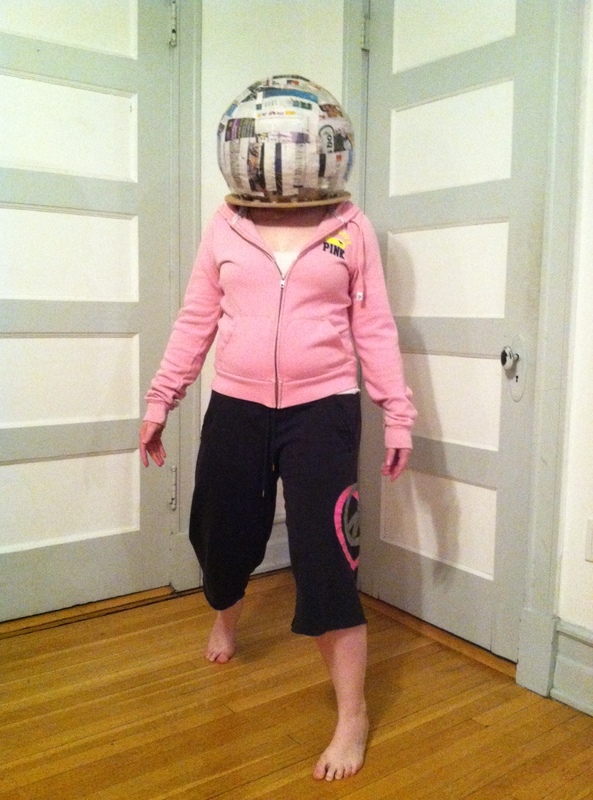 In no time at all, I had a reinforced frame for Eleanor Lamb’s helmet. 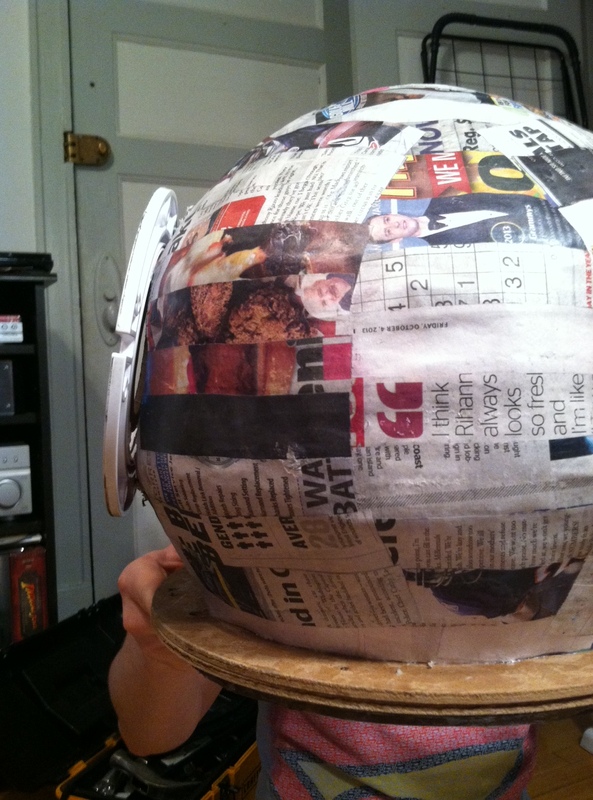 Our next step on the helmet is to papier-mâché and then go to town in the same way we did Subject Delta’s helmet. I don’t know about you all, but I could use a break from Subject Delta’s helmet. 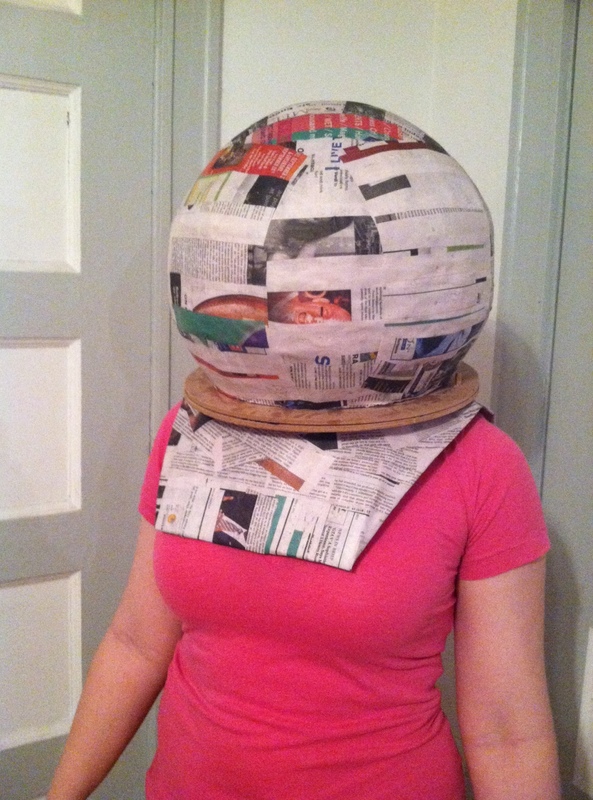 This week, we began work on Eleanor Lamb‘s helmet. Daniel kept saying that this shape was going to be a whole lot easier to execute and I kept telling him to stop saying that! But he doesn’t listen to me so everyone knock on some wood! 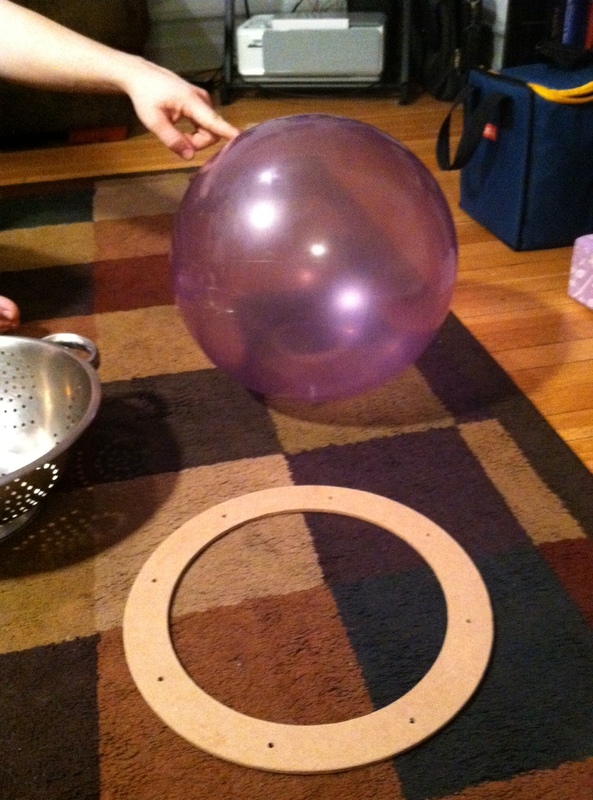 First of all, we needed to get something to help us build the shape of her helmet and something to anchor it to; a bouncy-ball and a flat wooden ring. You’ll also notice a metal strainer in the picture. Coincidence? I think not! After we taped the ball onto the base we needed something to stabilize it while we worked and, wouldn’t you know it, that ball fits perfectly in our kitchen strainer. Don’t worry; it was clean. 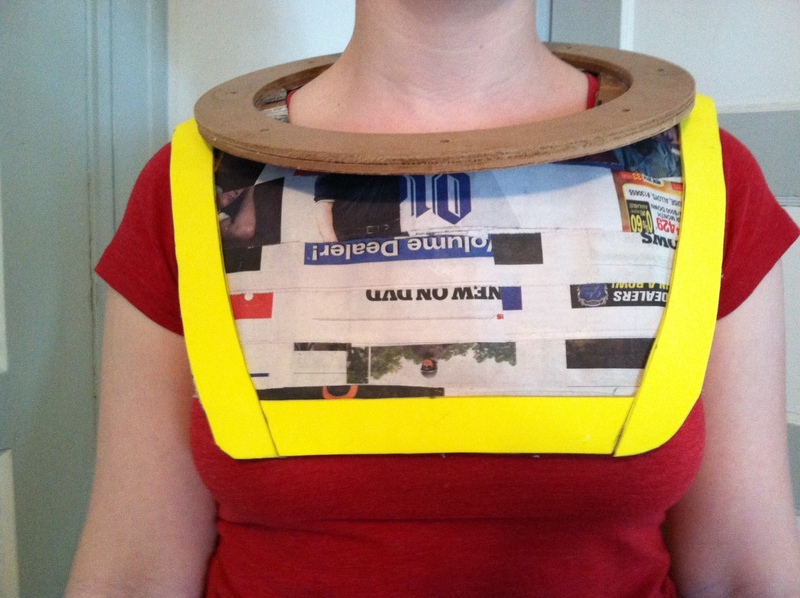 Next, I went back to cutting cardboard strips. 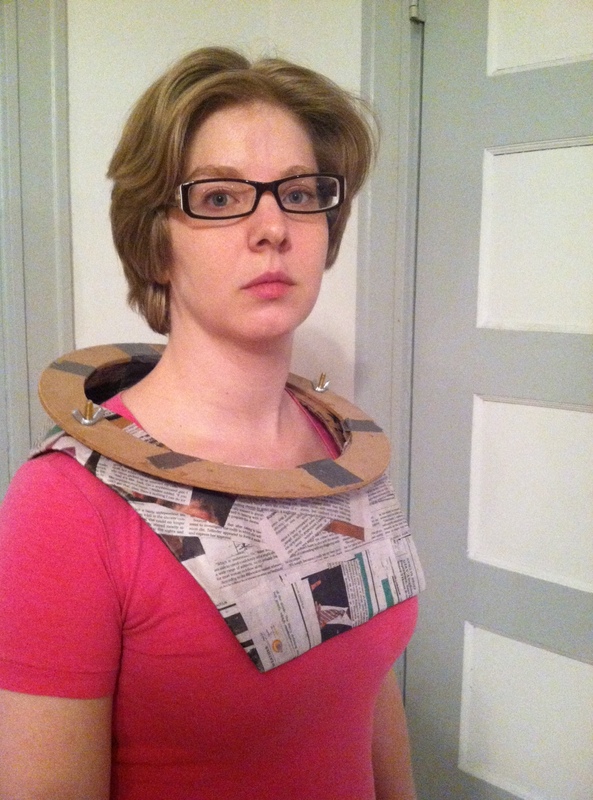 Have I mentioned how sick I am of cardboard strips? This time around was easier because we had the appropriate tools. I used a box cutter this time instead of the X-Acto Knife. 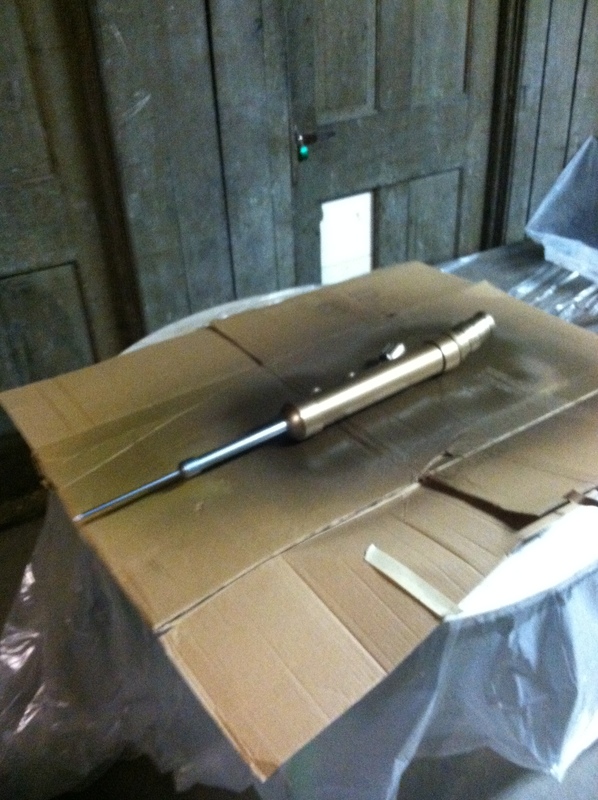 While the box cutter is anything but elegant, it gets the job done. It was easier to cut the long strips more quickly and the less time I have to spend cutting and bending cardboard strips, the better! 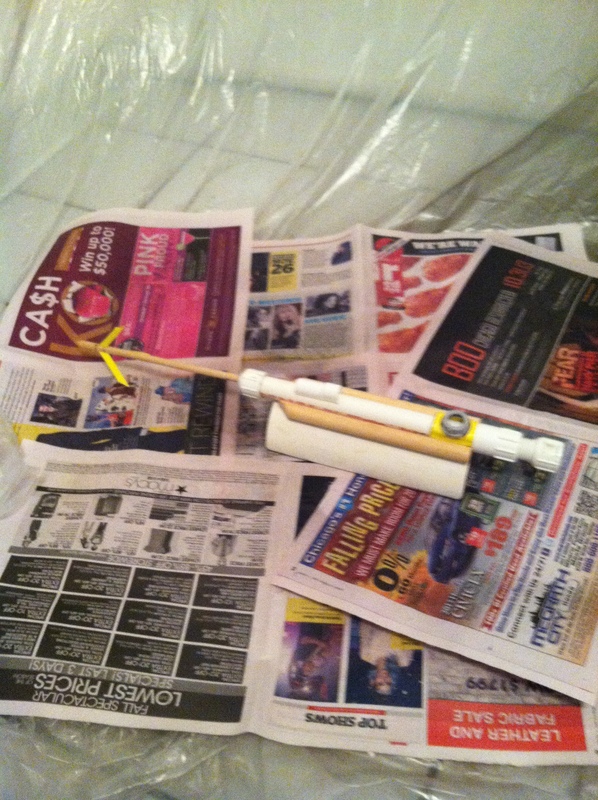 Next, we busted out the hot glue gun. 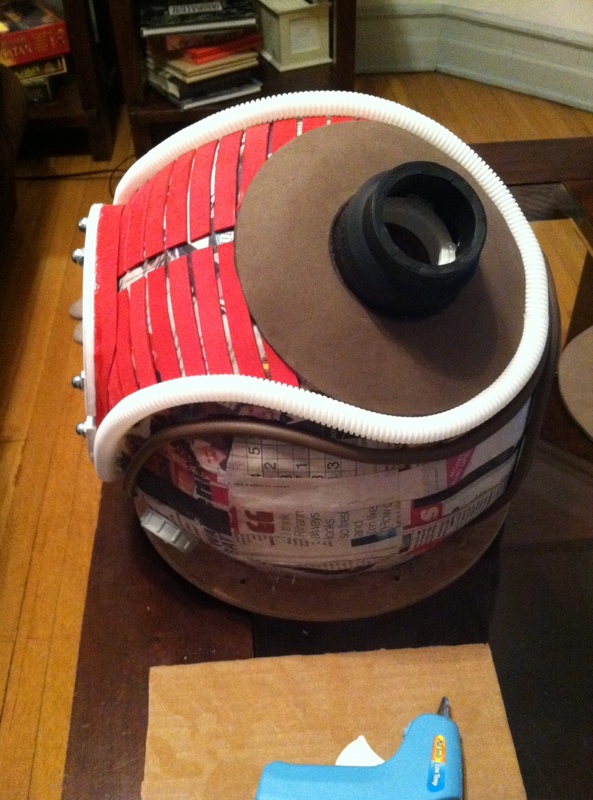 The plan was to tuck the cardboard strips between the ball and the wooden ring and then glue the cardboard to the ring. 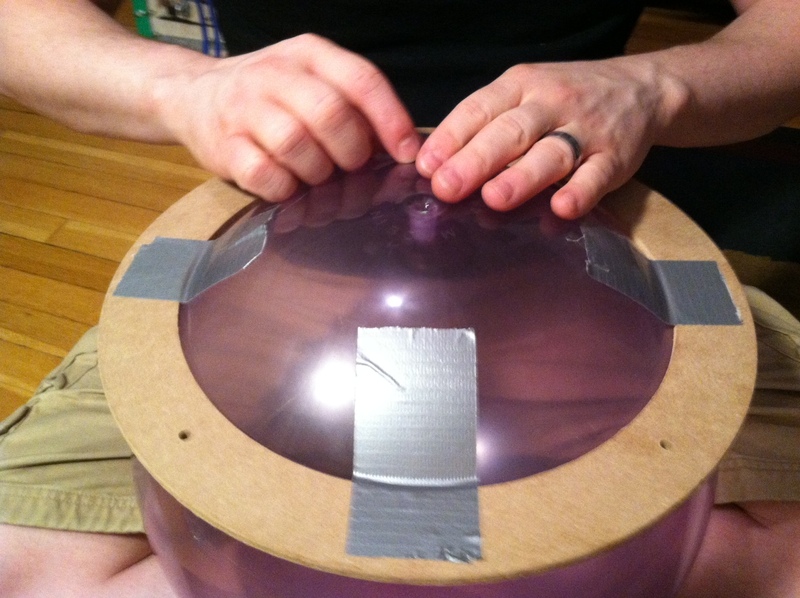 Daniel was very insistent about this process while I, on the other hand, was afraid that we would puncture the ball with the edges of the cardboard. 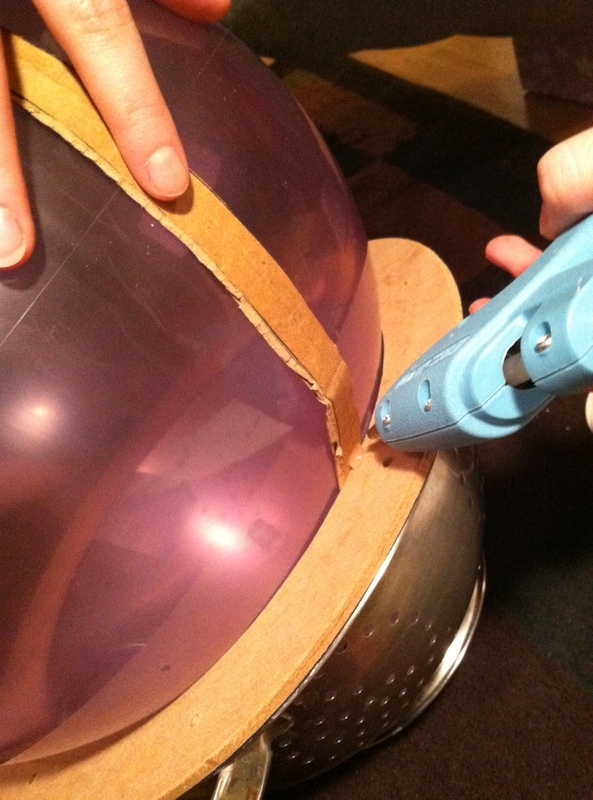 Oddly enough I wasn’t nearly as concerned about the hot, metal, plastic-melting tip of the glue gun that we would later aim at our only ball. We positioned the first strip, me wincing as Daniel pushed on the ball and wedged the cardboard indelicately into place, and I moved in with the hot glue gun. But I had to stop. Because of the legs on the front of the glue gun I couldn’t get the tip close enough without having to blindly shove the glue gun into the seam. 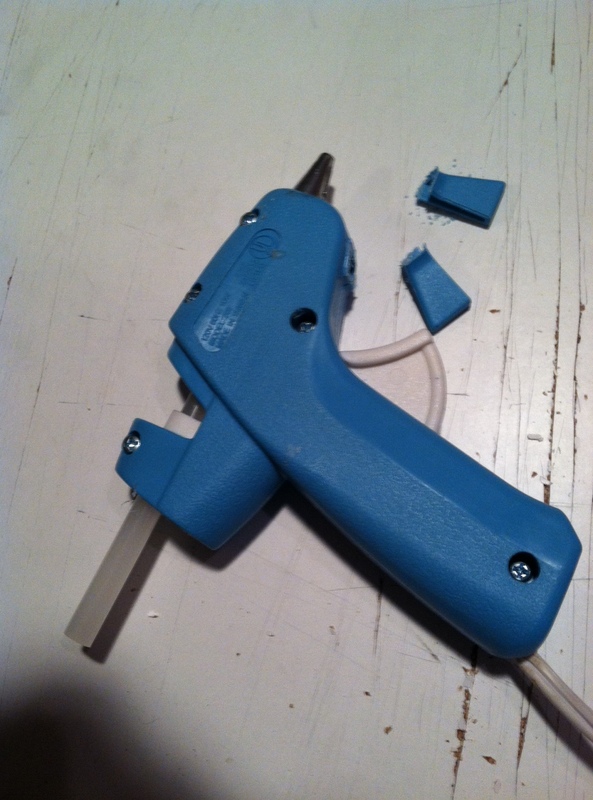 So we conducted the rarely attempted hot glue gun leg surgery. Now we could operate with full visibility. This was nerve-wracking work; Daniel watching as I put the glue into the seam. Sometimes we stressed each other out by trying to direct the other. This became another exercise in communicating about something more than the task at hand, we had to take care to let the other know when our tone of voice was a hindrance instead of a help. 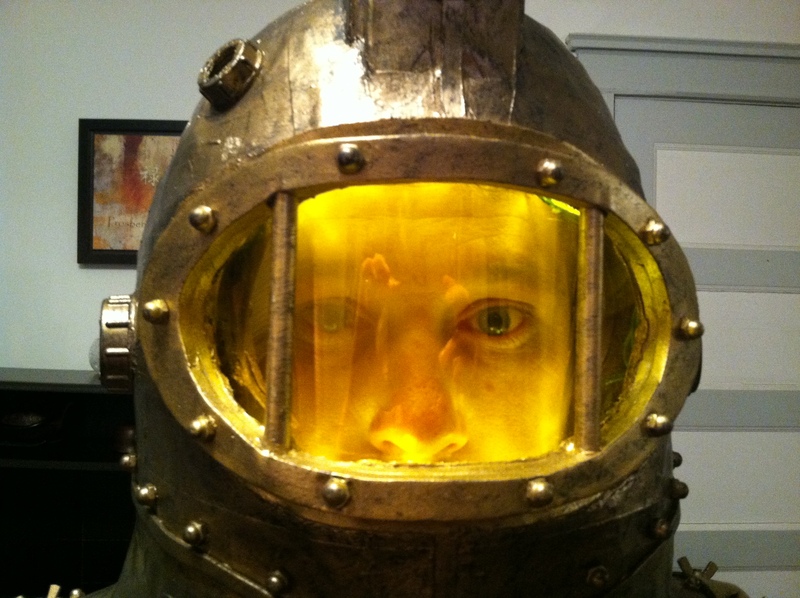 If there’s one thing I learned from the construction process on my helmet; it’s that the skeleton is the most important aspect of the helmet! Get the foundation correct and the rest will fall into place all the more smoothly. Sara had the right idea with ‘continual strips’, but I convinced her that we only needed half strips. 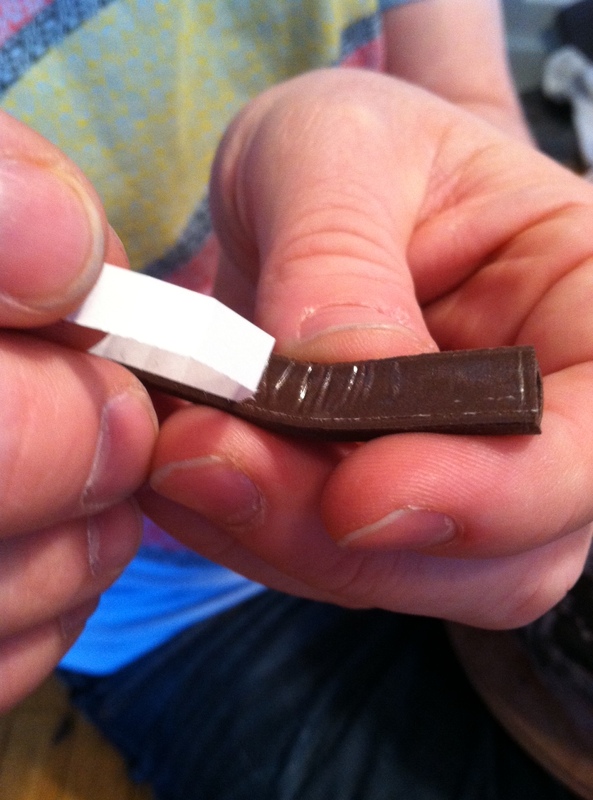 It was my belief that the other strips could be cut and made to meet the first strip in the middle. Sara would lay a strip of hot glue and I would smooth it with my finger, fusing the two pieces together. It turned into an awesome star shape! 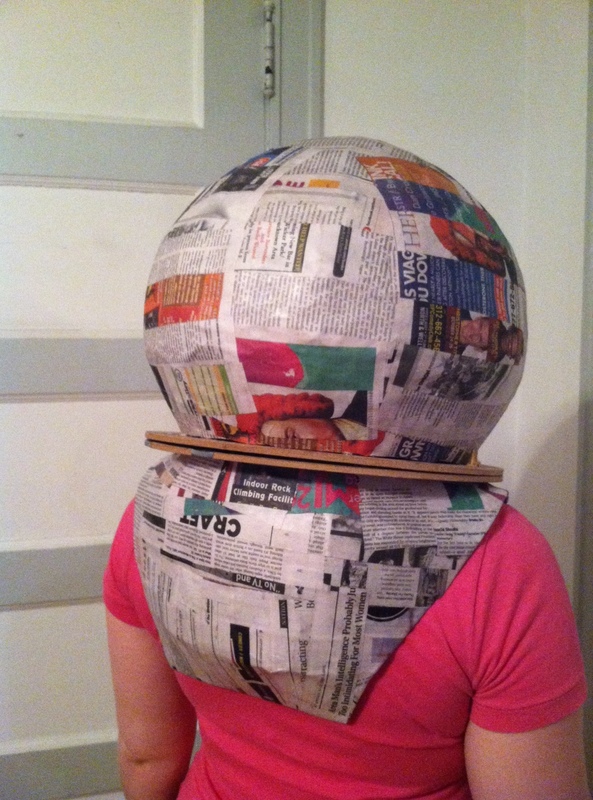 The result was better than expected and, once papier-mâchéd, will give us a dome with a much smoother and much more consistent surface. 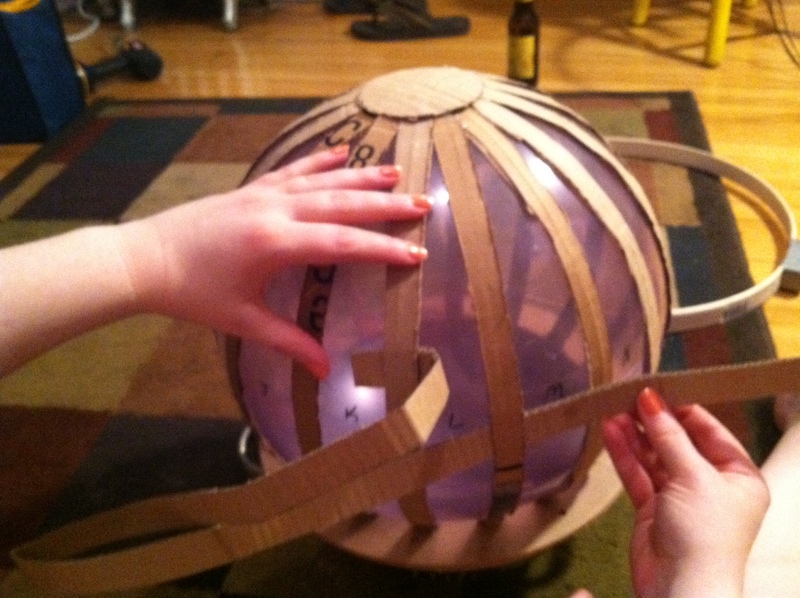 And, since Sara doesn’t get a helmet to help with the pressure at the top of the structure, we wanted to reinforce it with a cardboard circle. My solution was this. Trace the shapes of the negative space between the cardboard strips, trace the stencil onto the card board and cut it out. 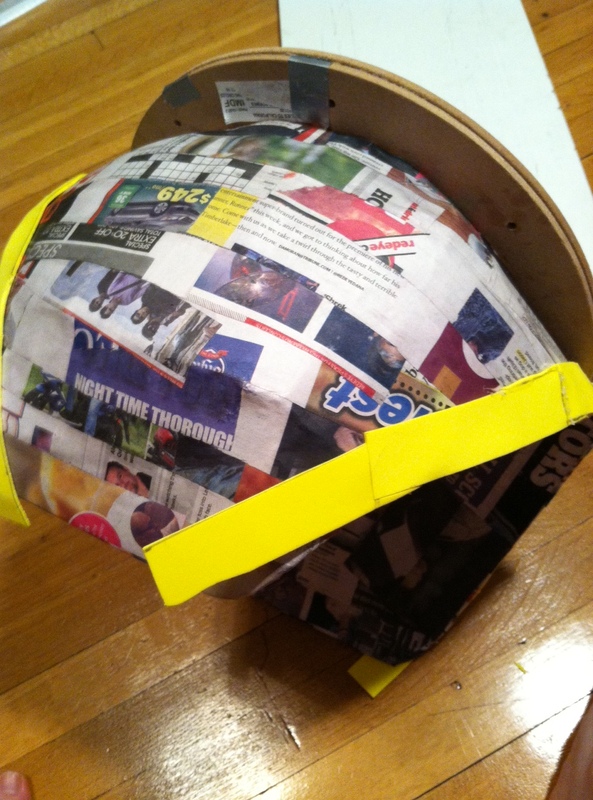 Then I should have been able to glue the wedges of cardboard in between the strips and then we’d have a solid ball of cardboard that was safe to papier-mâché and cut. 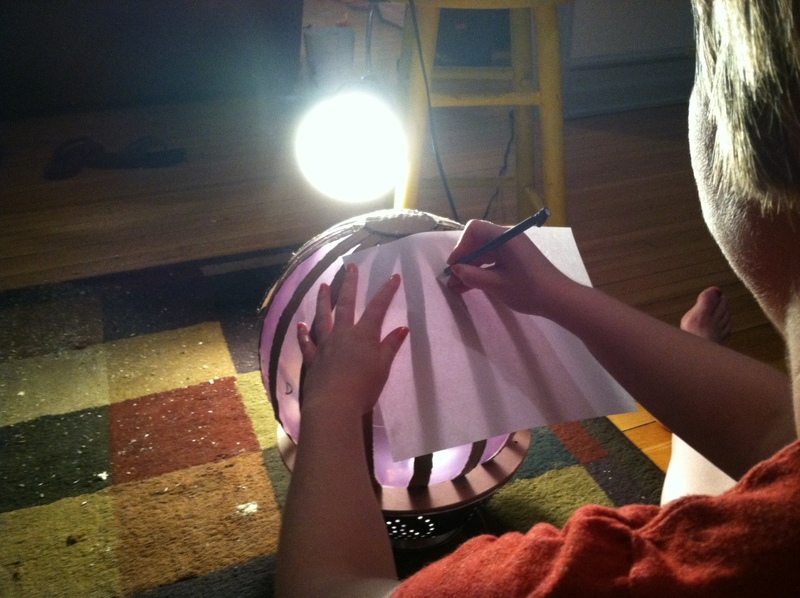 So I had Daniel rig up that light and I started working on the first section with printer paper. Let’s analyze this step by step. 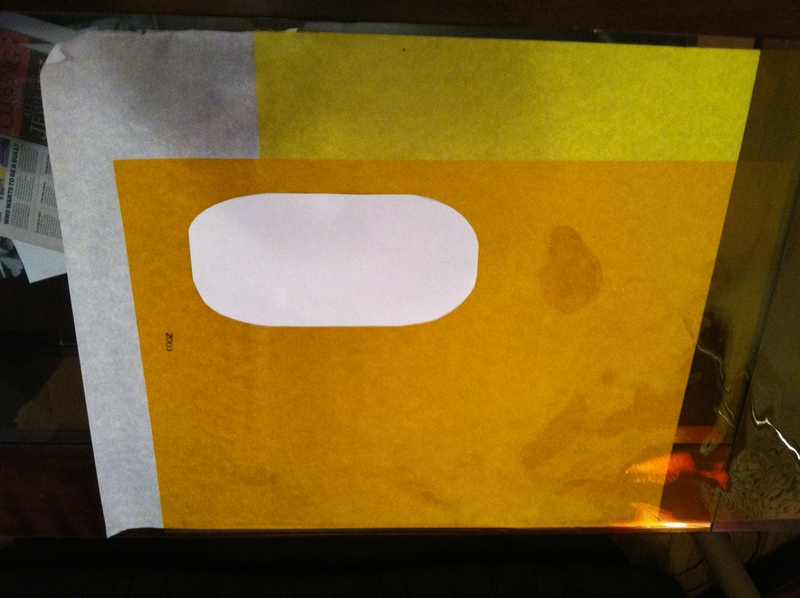 Firstly, I should have used tracing paper instead of printer paper. 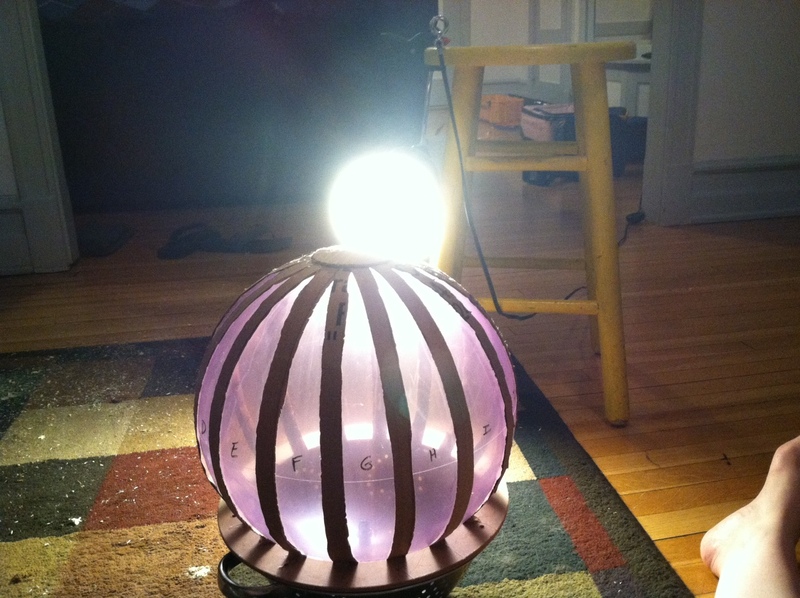 Although I thought I had solved the translucency problem by back lighting the ball. Secondly, remember how I said that we had bought a cheap X-Acto Knife instead of splurging on a really good quality one? Well, that cheep, bendy X-Acto Knife cut the shape I needed but it cut at an angle so when I went to fit it in between the cardboard strips I had to trim it. 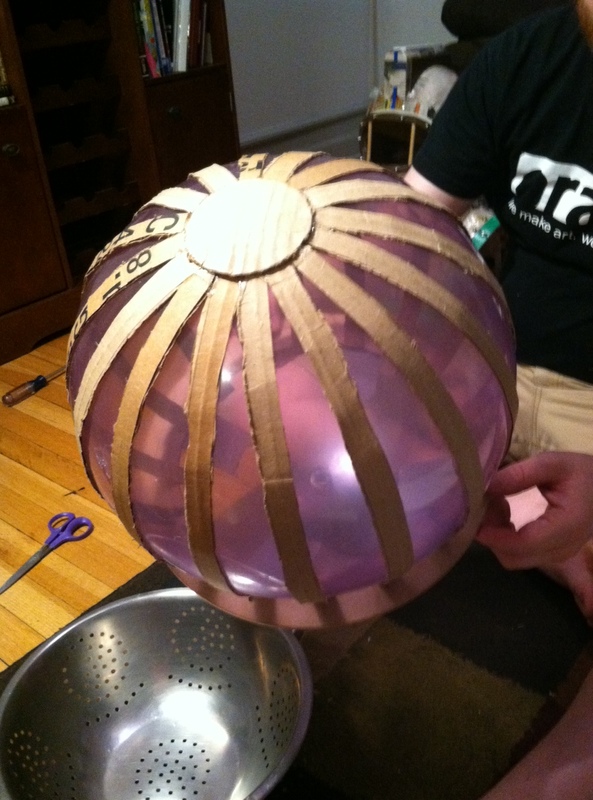 This trimming resulted in our third point; all that space between the wedge and the cardboard strips for the hot glue to seep through and pop our only balloon. At this point I stopped and did some math. 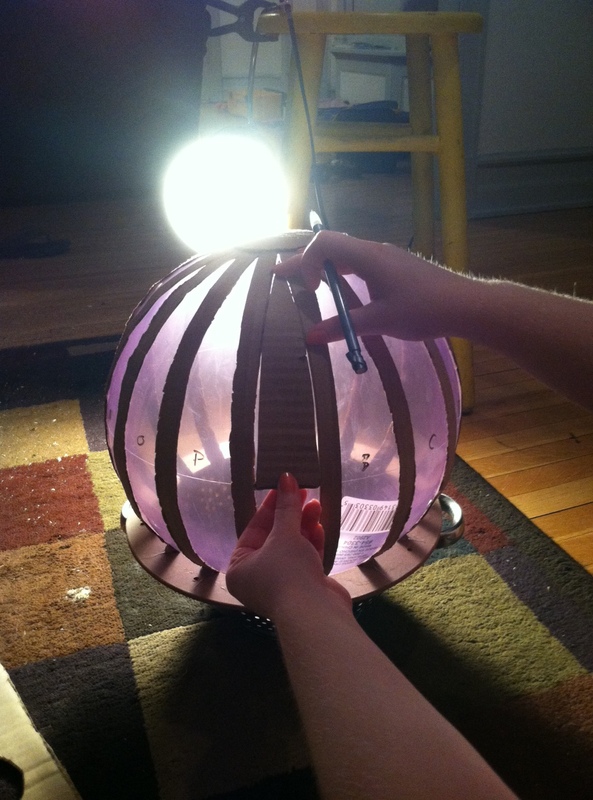 There were 13 sections on the ball and each would require two stencils; a top and bottom. These two stencils would not be identical from section to section so each would have to be drafted and drawn. That’s 26 stencils for those of you counting. Now, if they worked perfectly I could probably whip them out in about 5 minutes a piece which would put me at 130 minutes or a little over two hours of work. But this calculation is based on everything being perfect the first try which, based on the first try documented in the pictures above, wasn’t going to happen. Daniel and I stared at each other as we weighed our options. Would it be worth the time and possible frustration to proceed? Or should we take some other course of action? The only problem with taking alternate action was that neither of us knew what that would be.